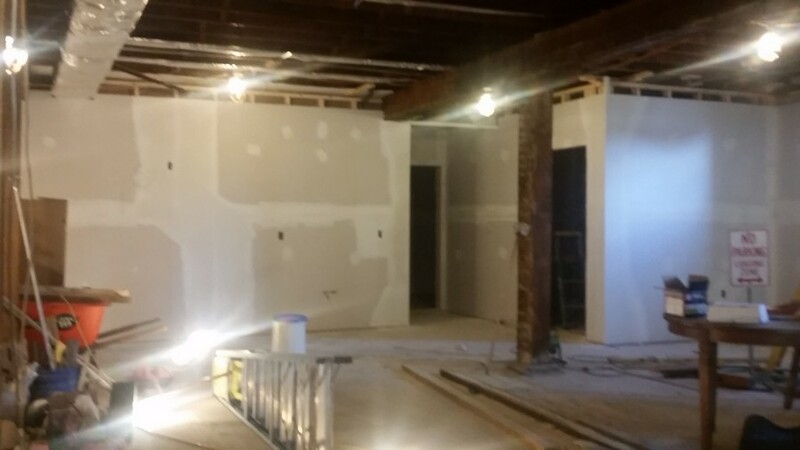 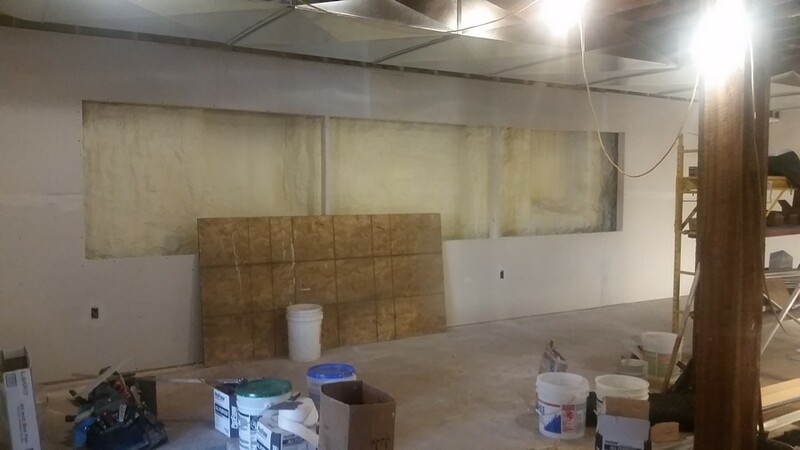 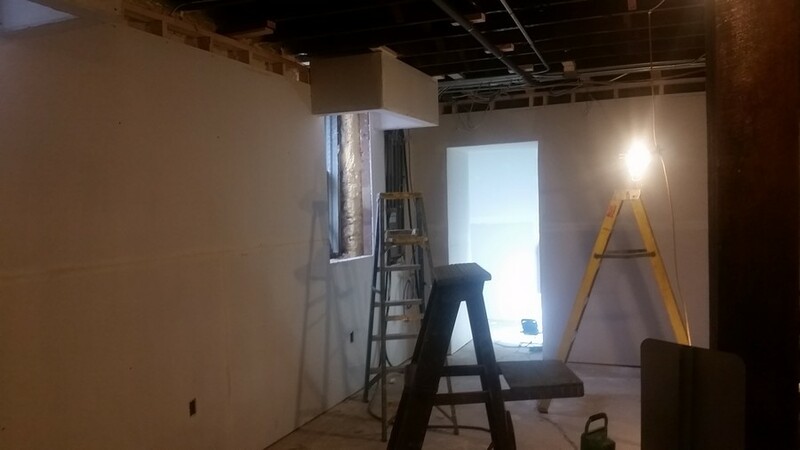 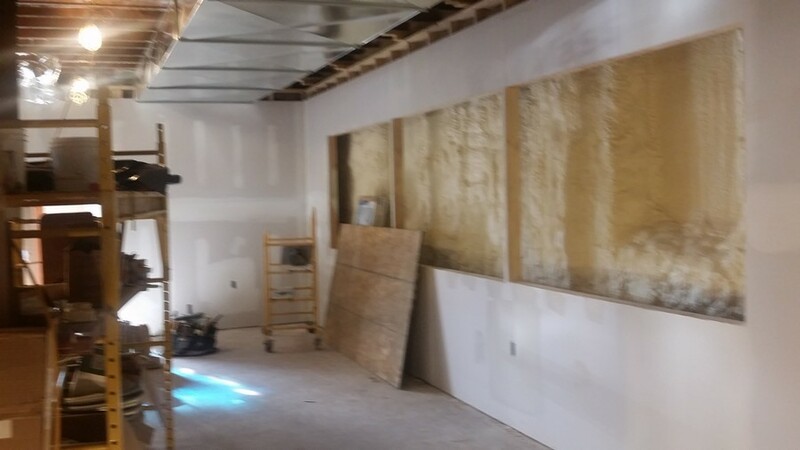 The sheet rock is almost ready to be painted. 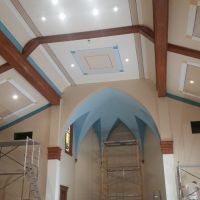 The Sanctuary is almost finished. 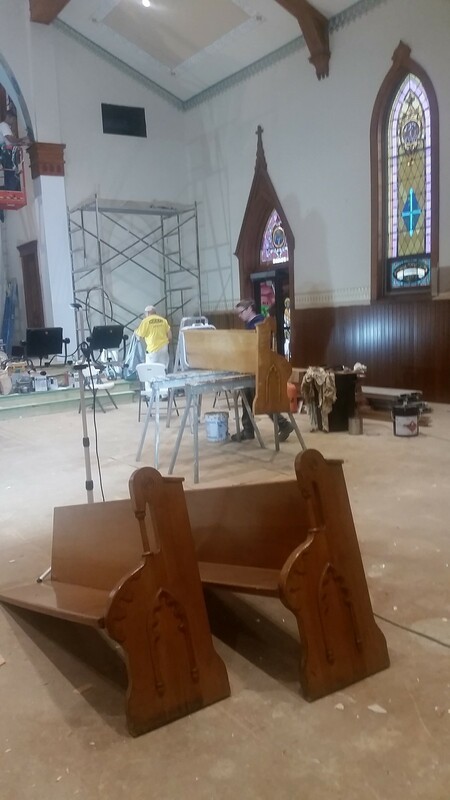 Liam is on his last of the pews. 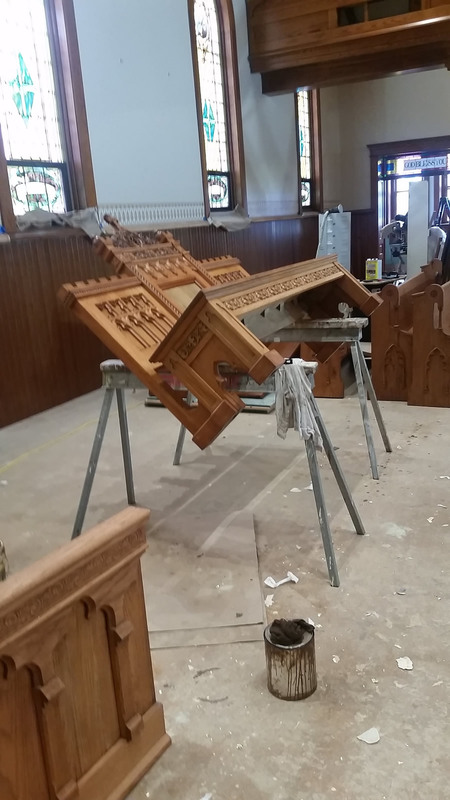 The new organ is here and the pipe are starting to go in. 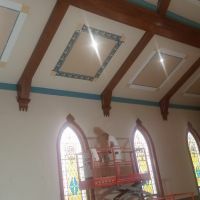 The pictures do not show how beautiful the paint and stencils are. 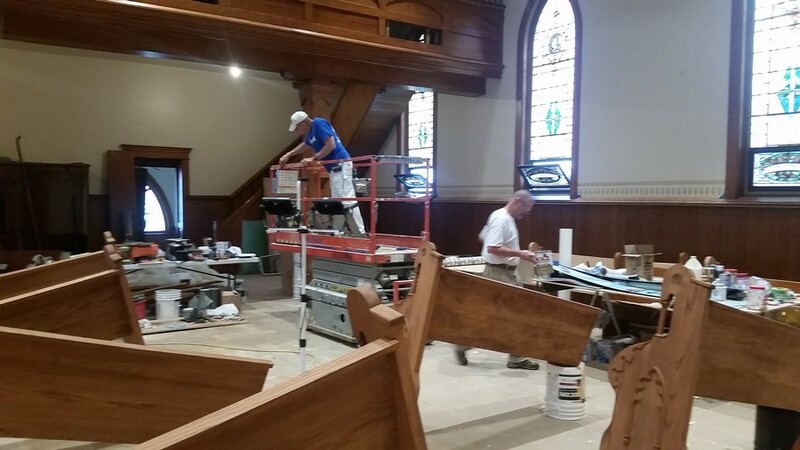 The church will be open after Mass this Sunday so everyone can see how beautiful it is. 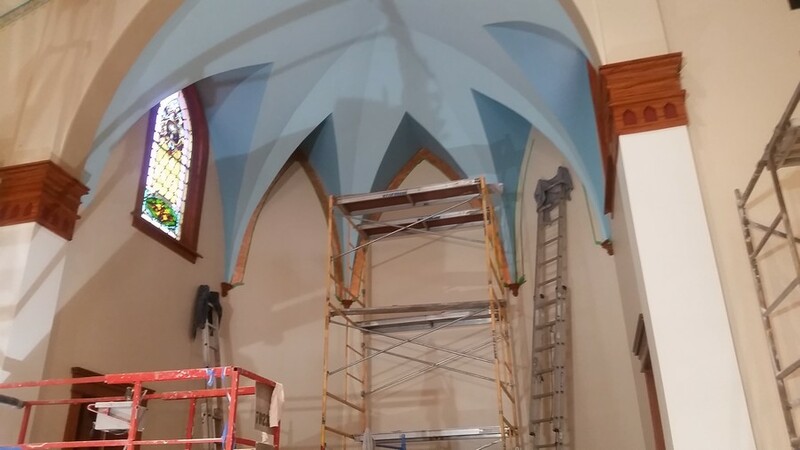 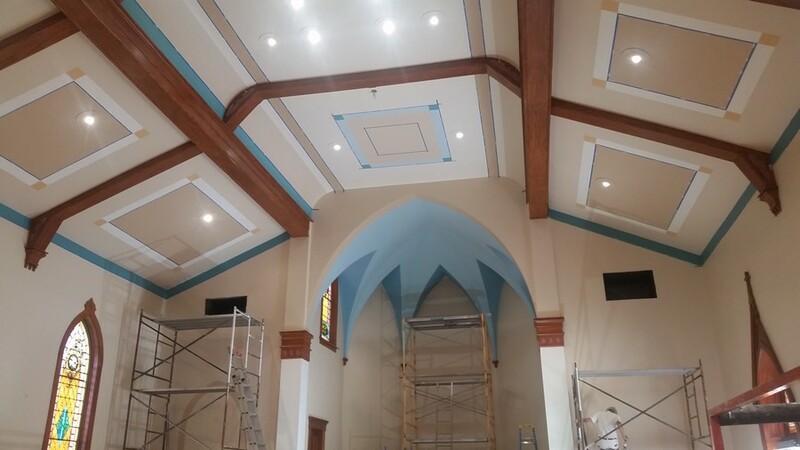 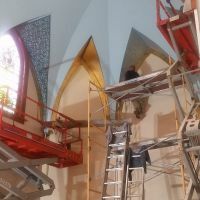 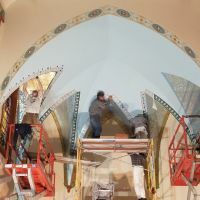 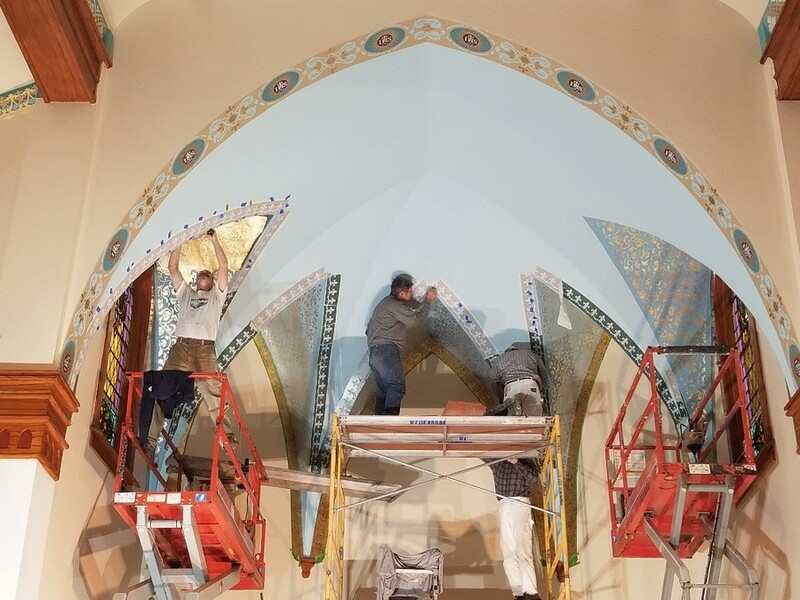 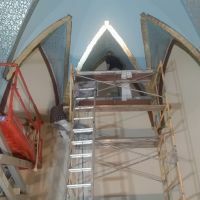 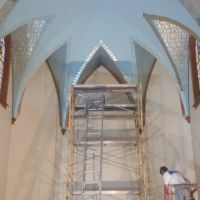 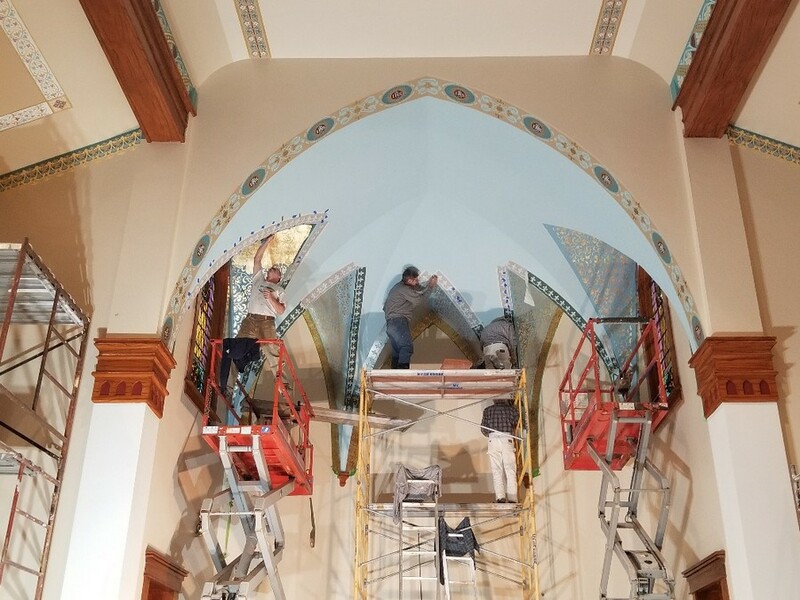 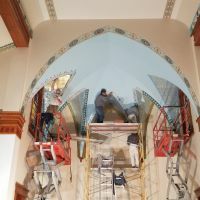 The painters are working on the last color for the sanctuary. 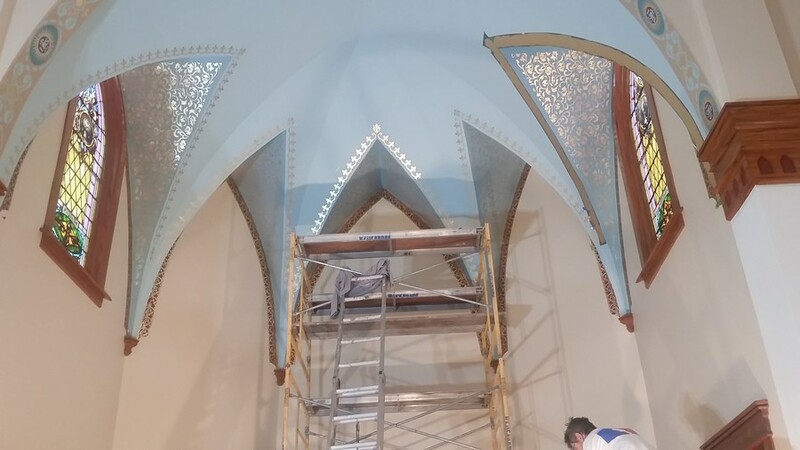 The gold lace looks beautiful with the lights shining on it. 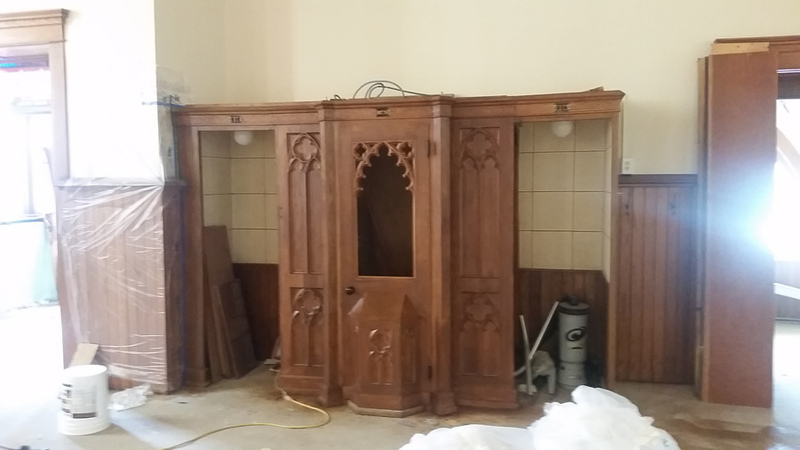 Liam is still stripping pews. 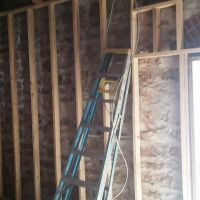 The sheetrockers were here over the weekend. 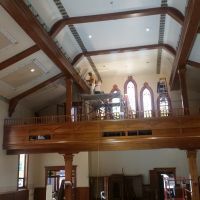 Hansen Hall is starting to look like a room instead of just a basement. 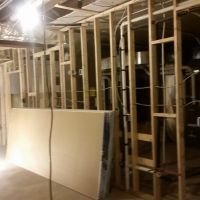 The walls are all sheetrocked for the elevator also. 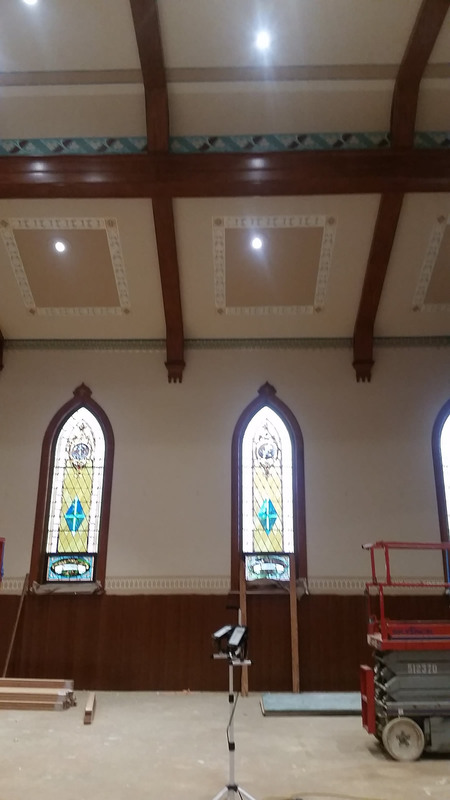 All the gold in the sanctuary is really going to shine once the lighting gets in. 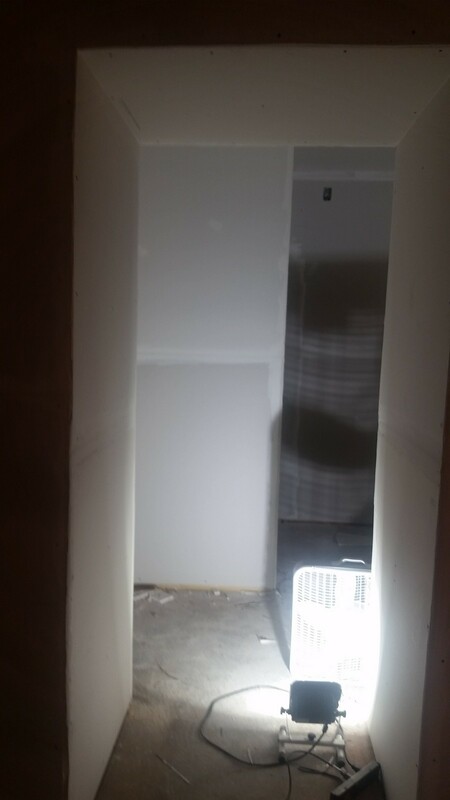 The hole is cut for the elevator lift. 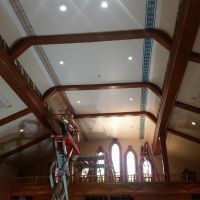 Terry's Electrical service is working hard in Hansen Hall to get it ready for the sheetrockers. 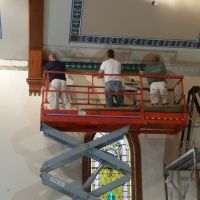 The painting crew is working hard to get the stencils done. 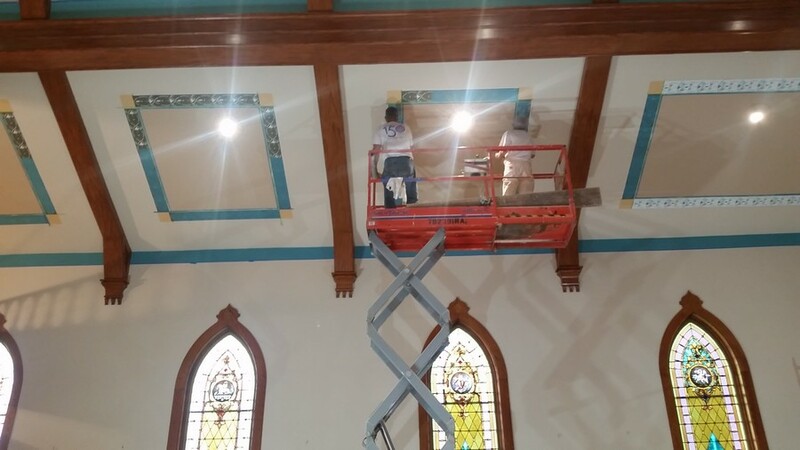 Since we will have new energy efficient lighting, almost all of the electrical is getting replaced. 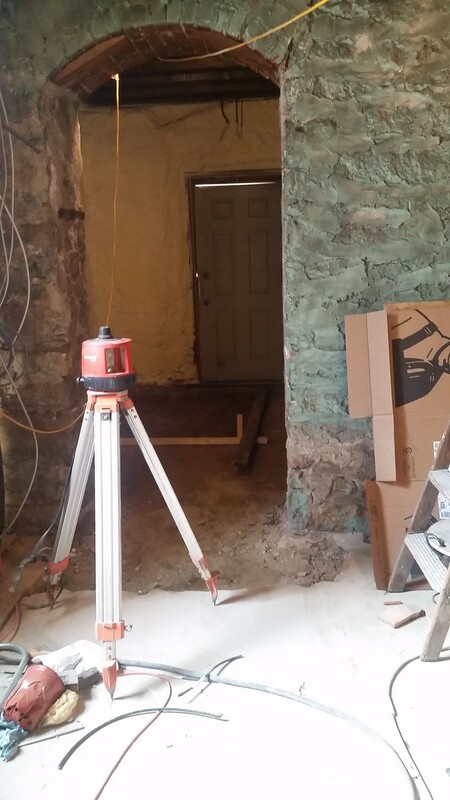 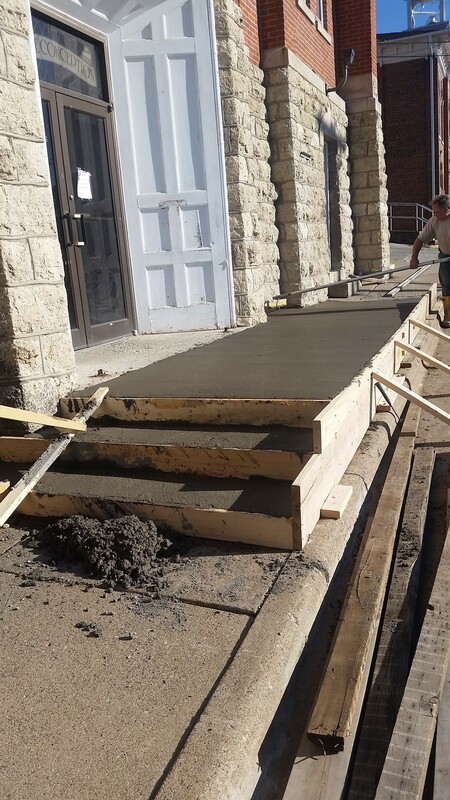 The concrete is getting poured in the room where and the elevator lift is going and for the outside ramp. 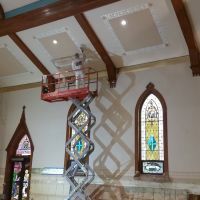 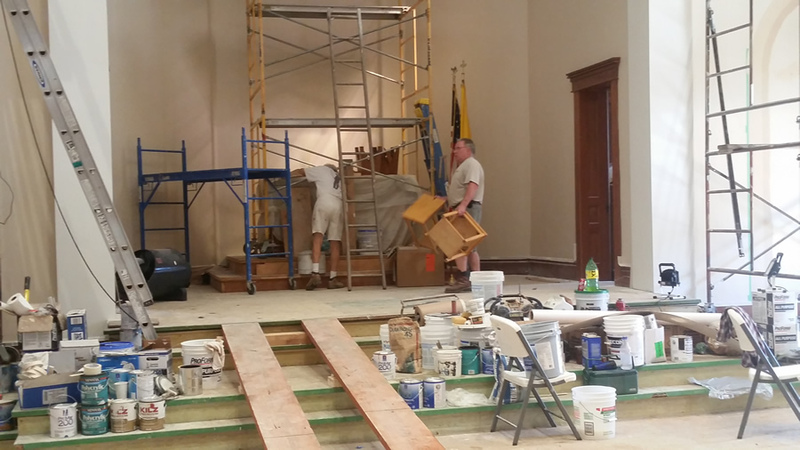 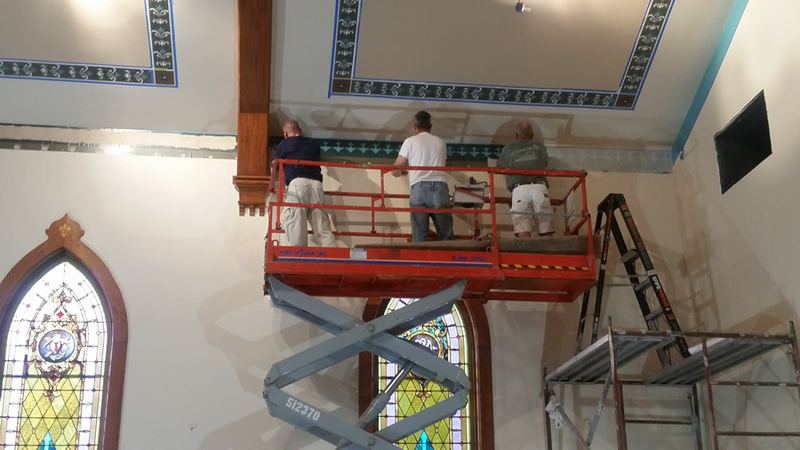 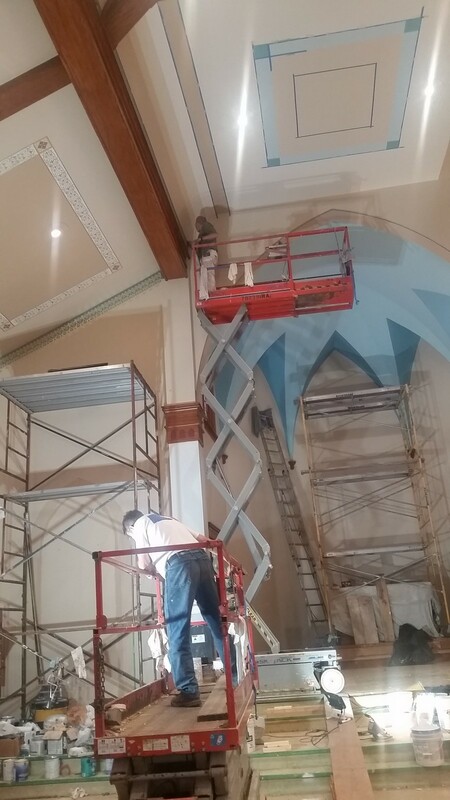 Painters are working on the sanctuary. 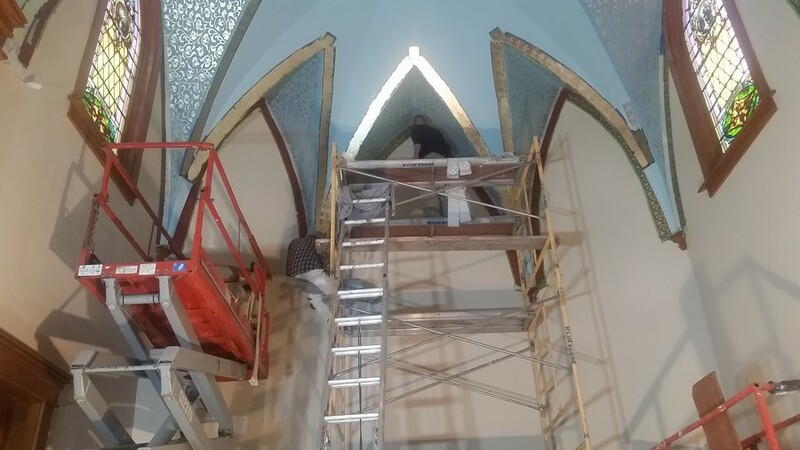 The gold is up around the inside arch. 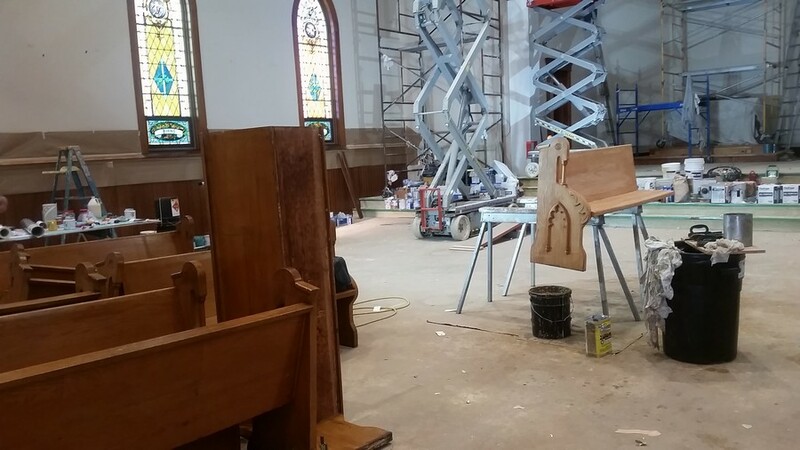 Pew stripping is still in the process. 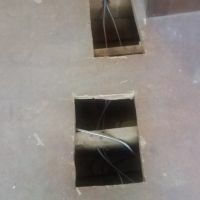 Terry's Electric is stringing more new wire up. 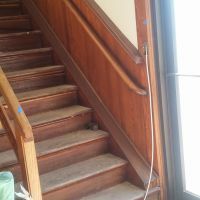 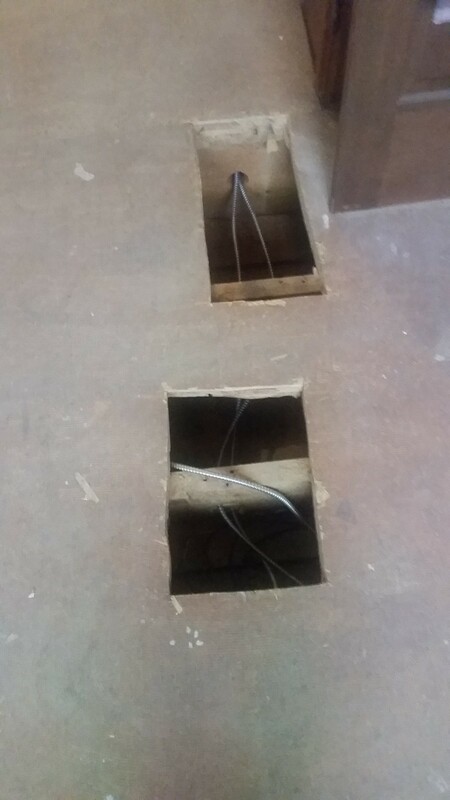 We will have new wiring throughout the church. 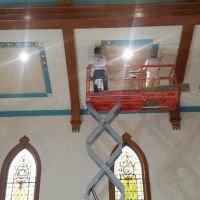 He has the mounts installed for the new lighting on the top of the stairs. 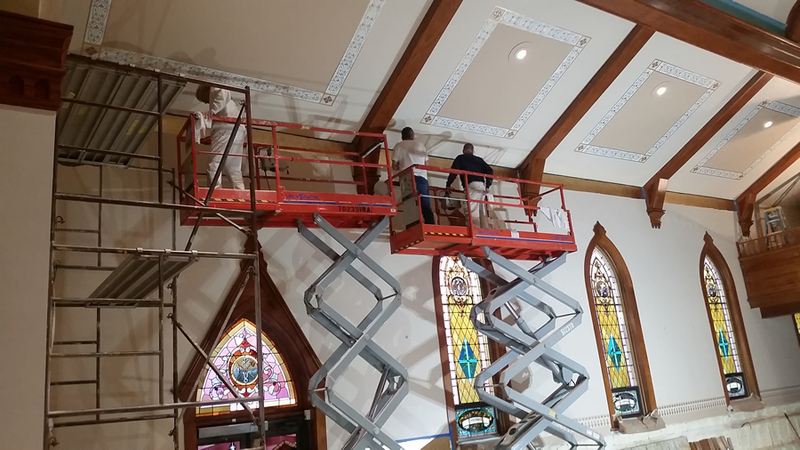 The painters are done with the main part of the church and now focused on the front. 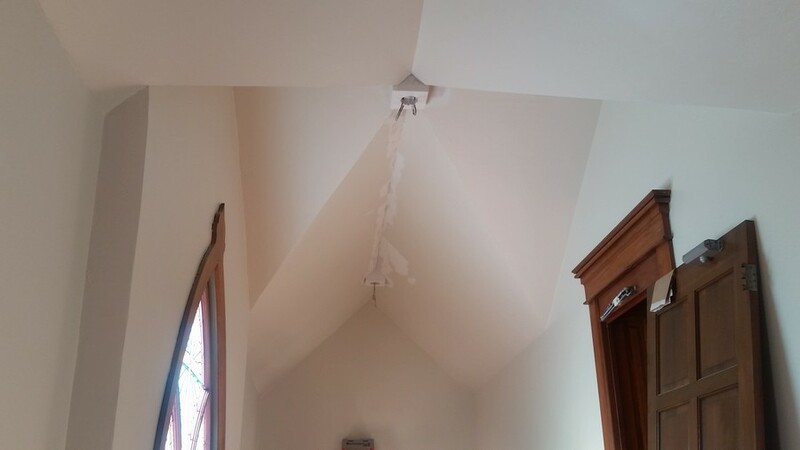 The pictures just do not do it justice. 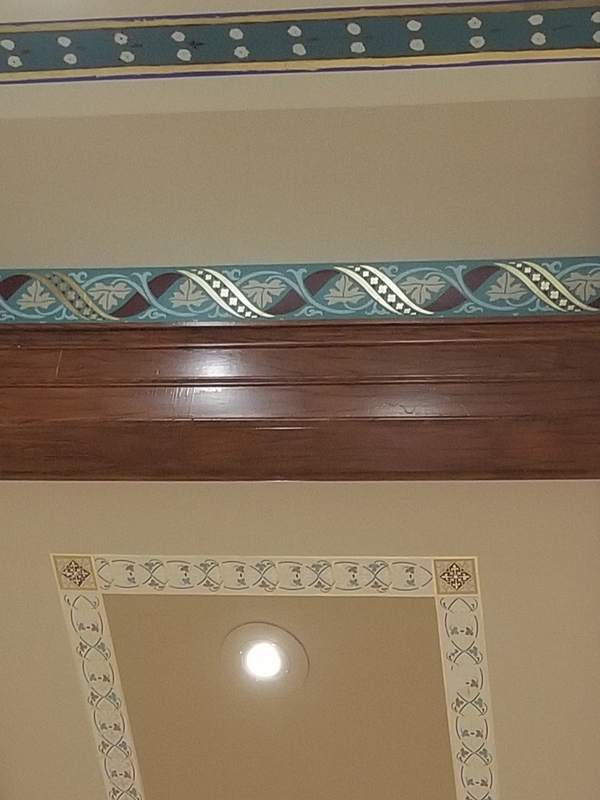 The gold is so beautiful. 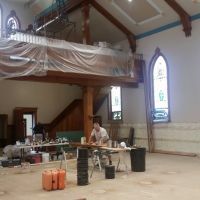 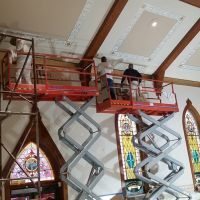 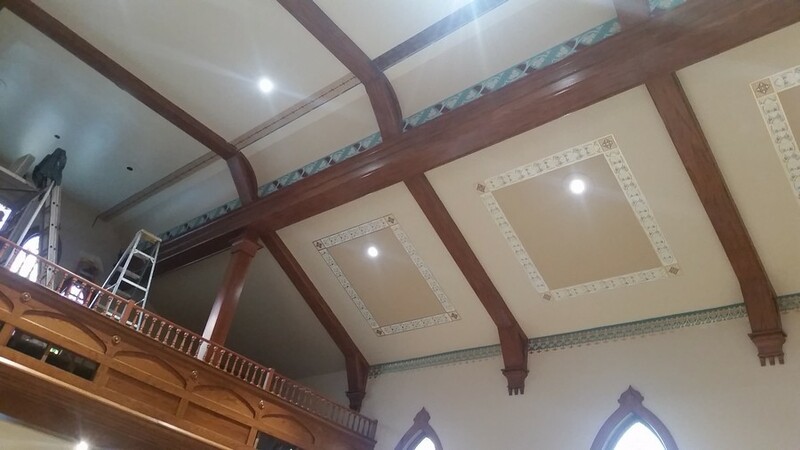 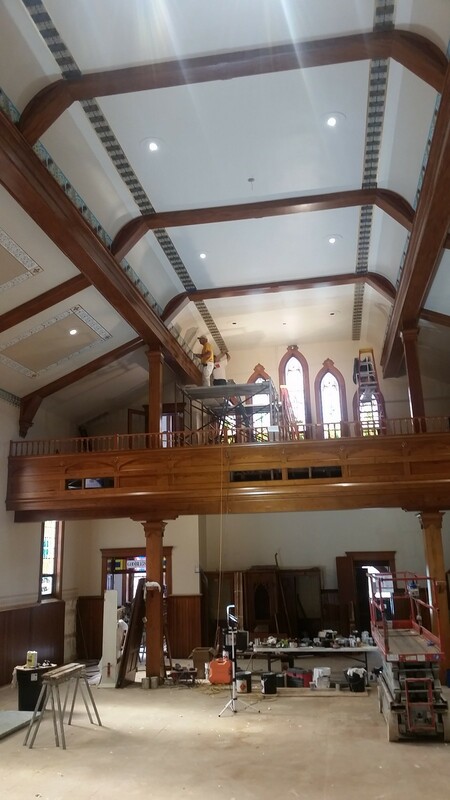 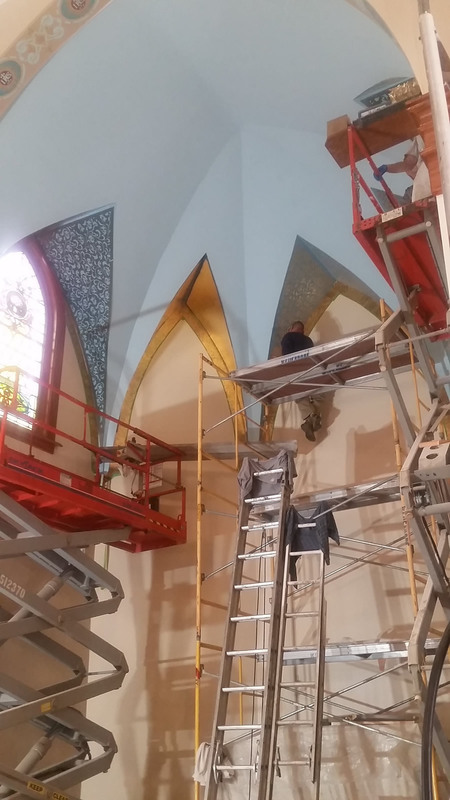 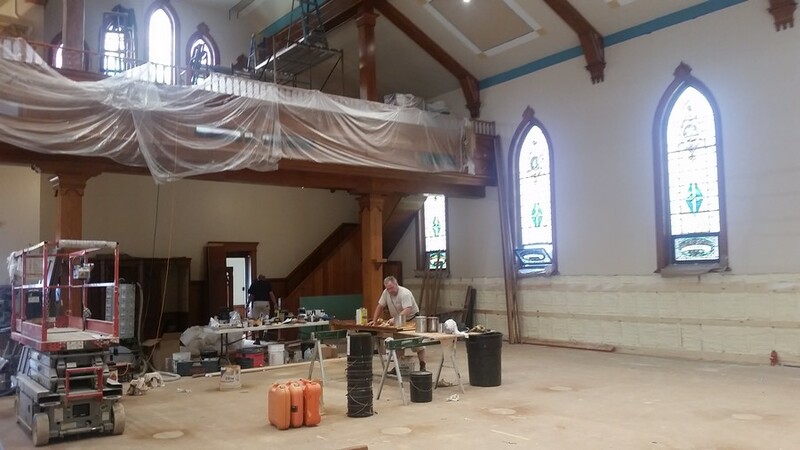 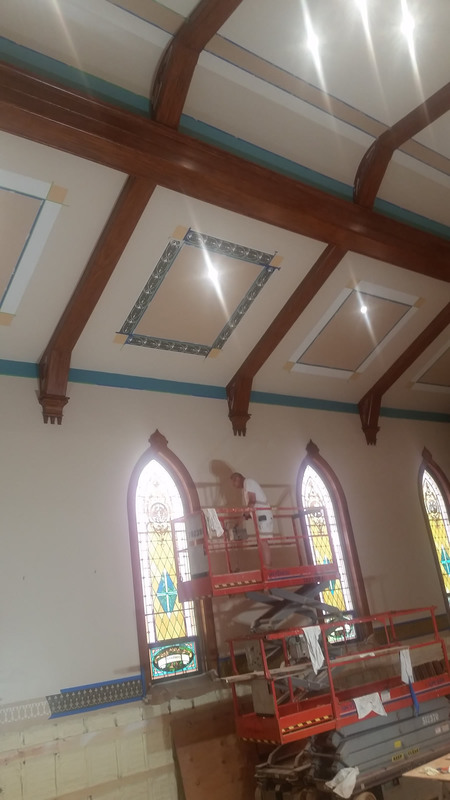 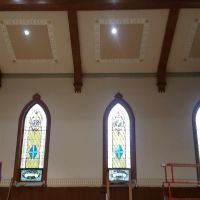 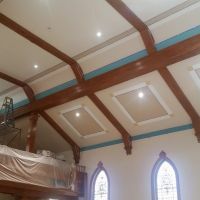 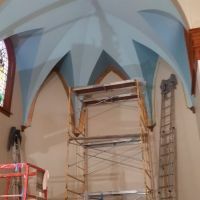 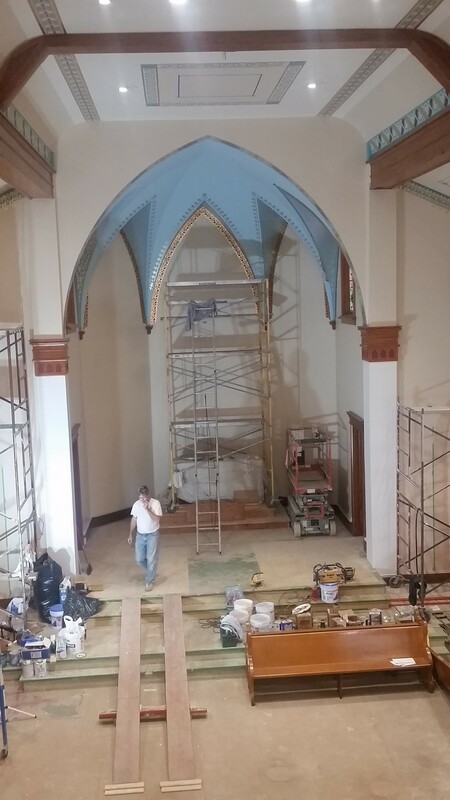 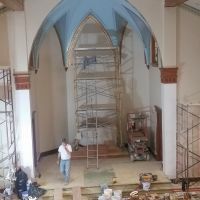 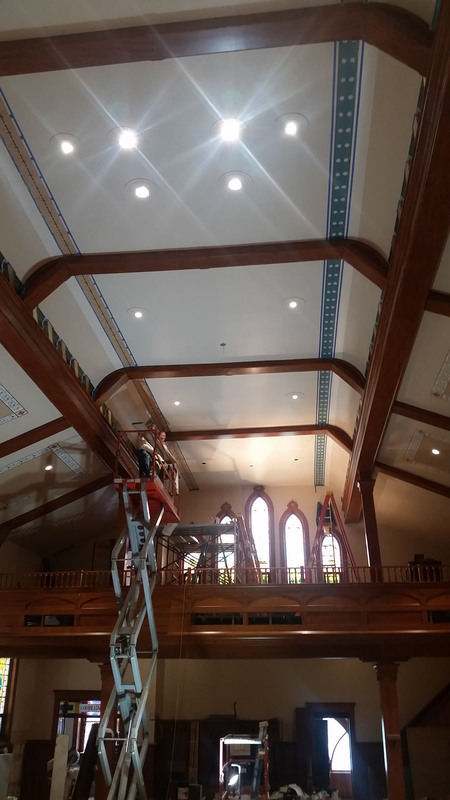 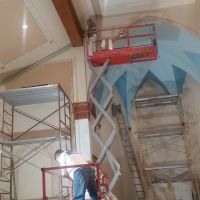 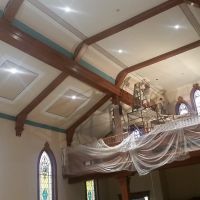 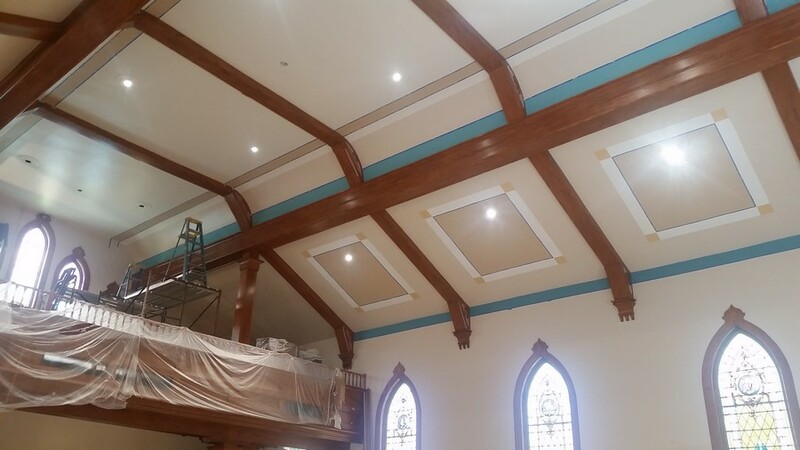 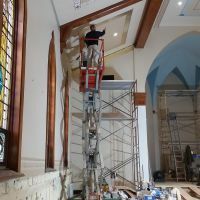 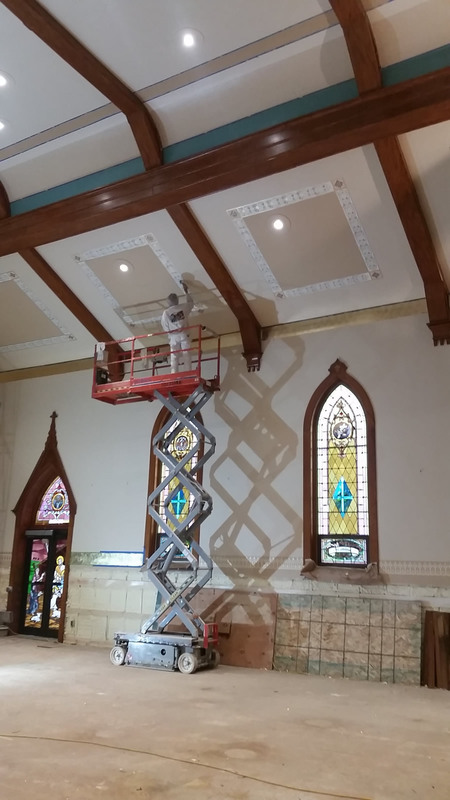 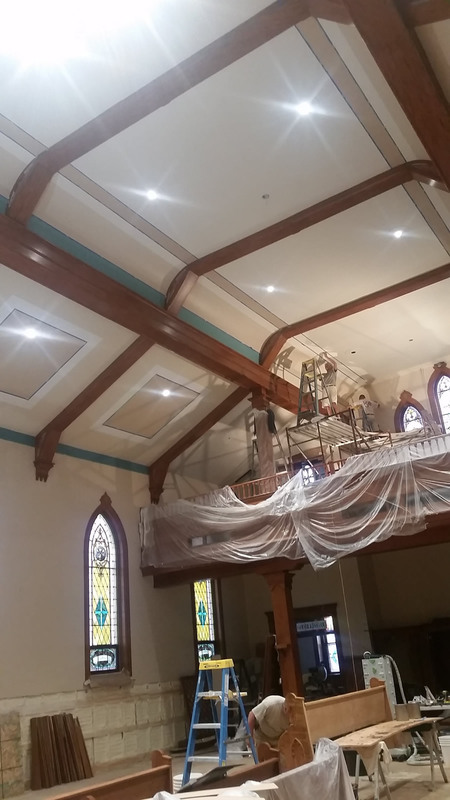 The painters are up in the choir loft. 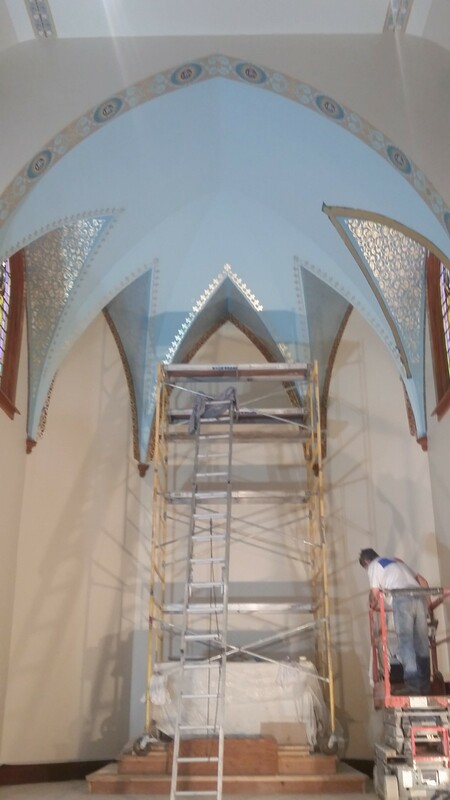 The gold color just sparkles. 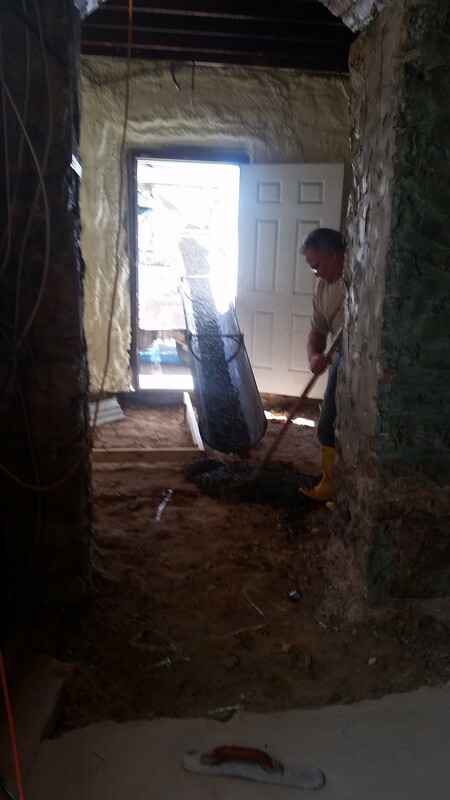 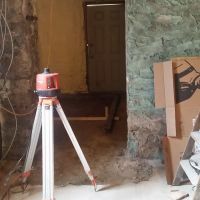 The old cement is removed and the floor is getting leveled for new concrete in the room that will house the elevator lift. 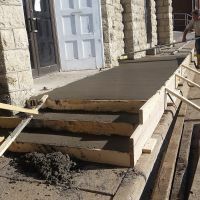 The outside ramp will get poured at the same time. 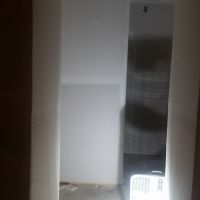 Just keeps moving forward. 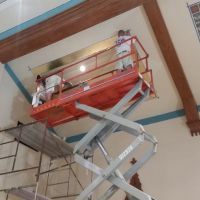 The painters are working on getting the middle of the nave done. 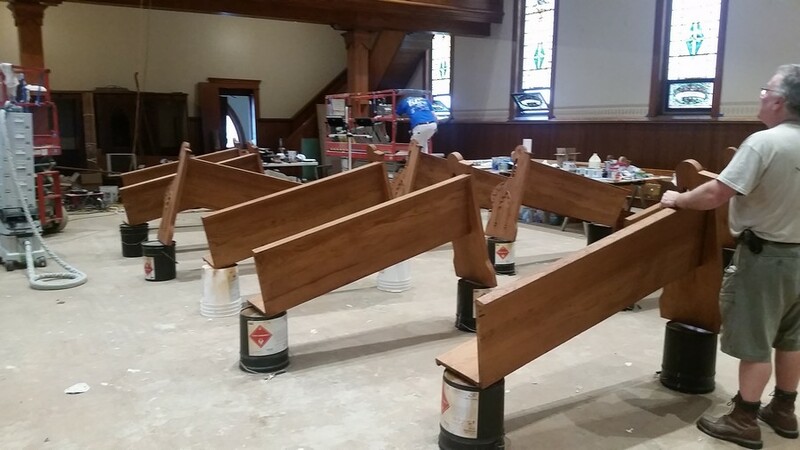 Steve has been getting the pews done. 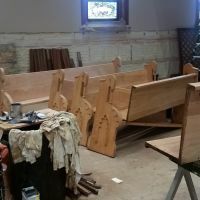 He has the altar bench all prepped for another coat of stain and varnish. 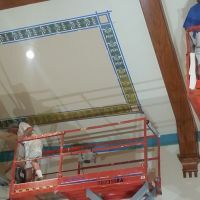 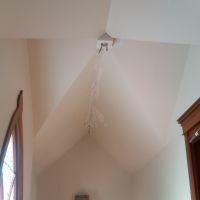 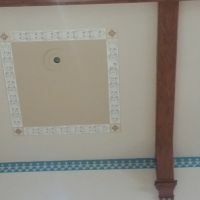 The painters are working on the middle ceiling stencils. 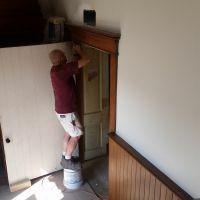 Steve has put up the new wainscot and top trim. 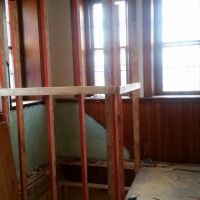 All the wainscot had to be made new. 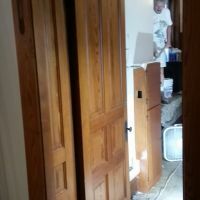 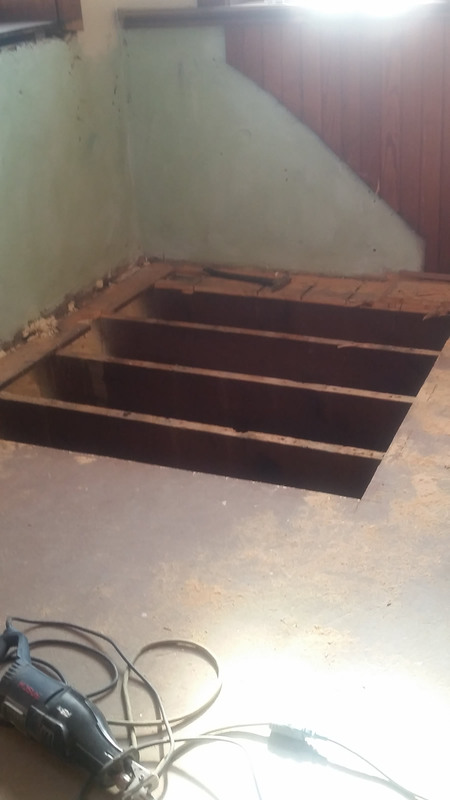 When Servicemaster took off the old wood it broke up too much to put back in. 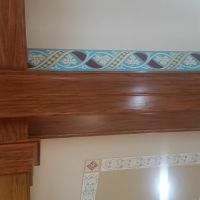 The new top trim will still need to be stain and varnished. 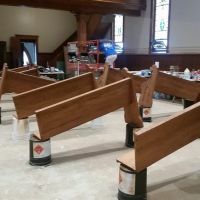 Some more pews are getting a new coat of stain and varnish. 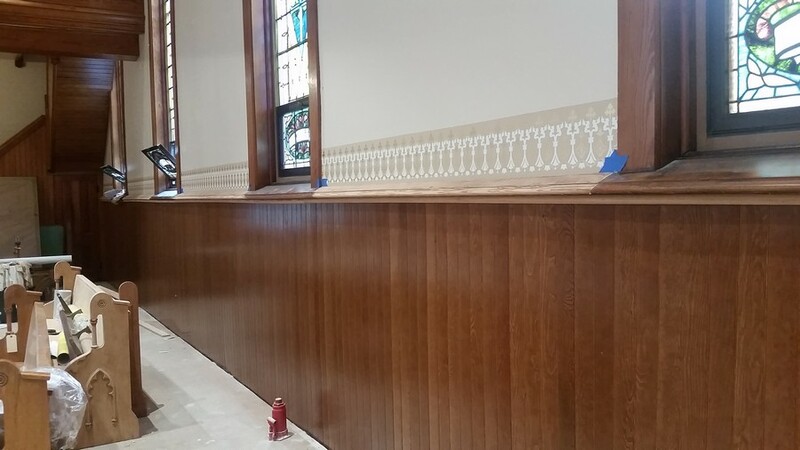 The wainscot is getting put back up with each board having a new coat of stain and varnish. 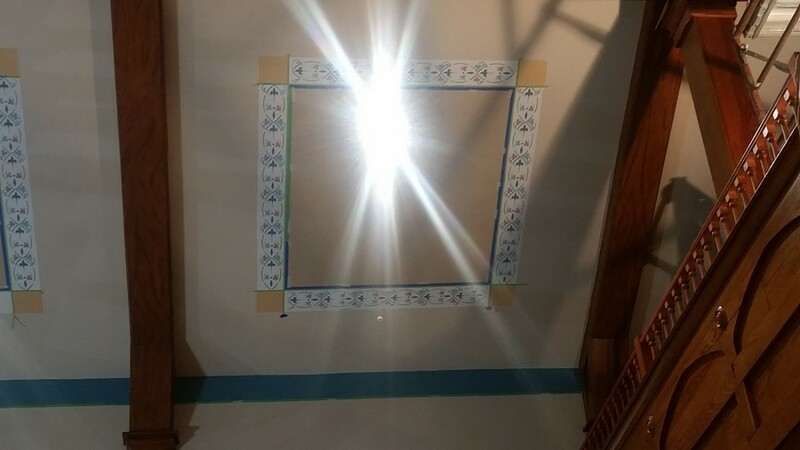 The painters are putting more stencils on the ceiling. 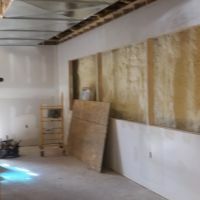 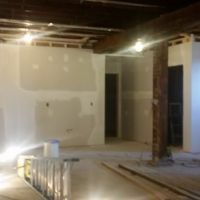 I am getting excited for how it will look once it is finished. 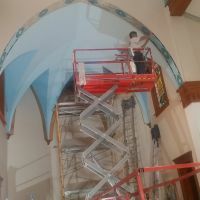 And more stenciling...Hopefully everyone got a chance to look inside the church this past weekend. 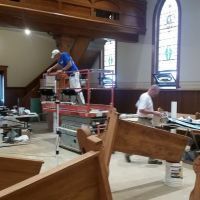 If not, there is some display information on the tables upstairs in the Parish Life Center. 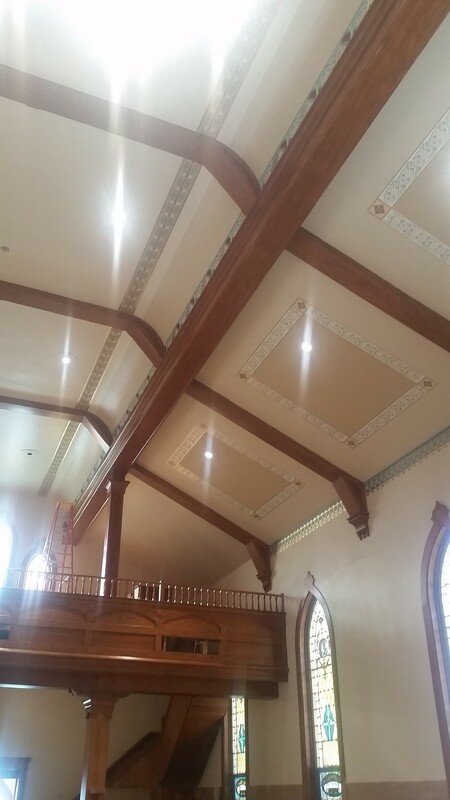 The main part of the church is just beautiful with all the gold shining down at us. 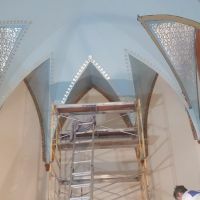 More stenciling...One side has the gold flake done and the other side has it applied and waiting to dry before peeling it off. 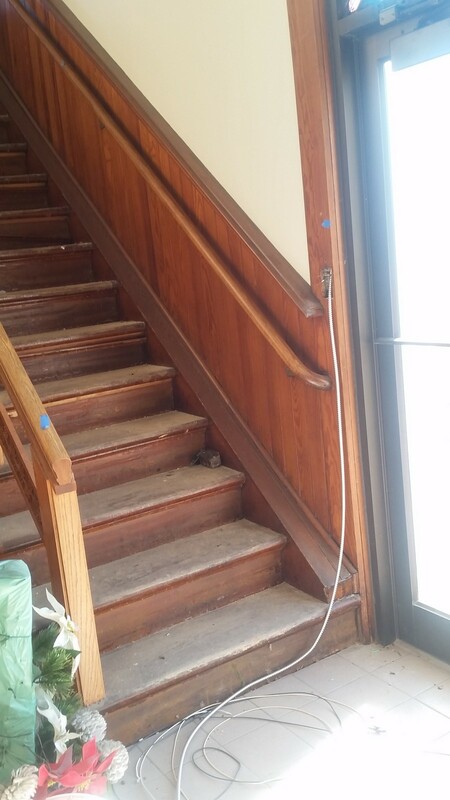 Terry's Electric is stringing more wire. 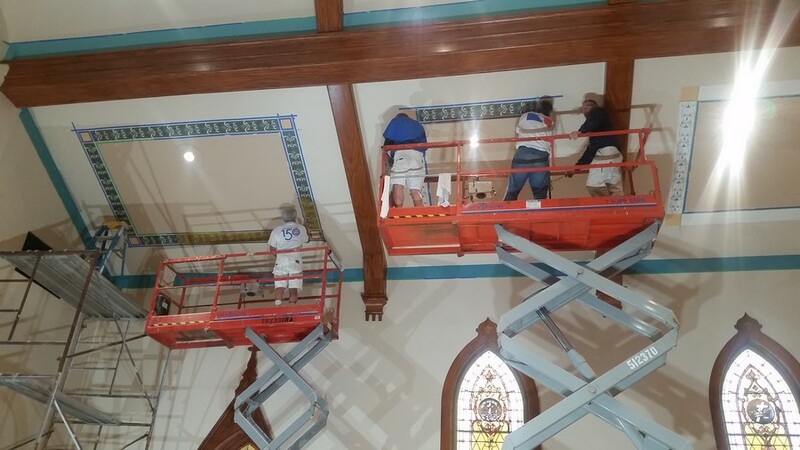 The painters are still hanging and painting stencils. 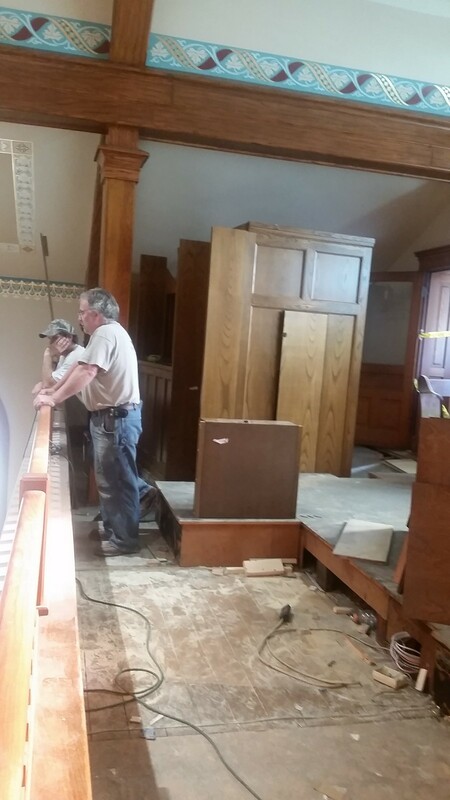 Eileen has been busy running between the church and school giving the guys directions. 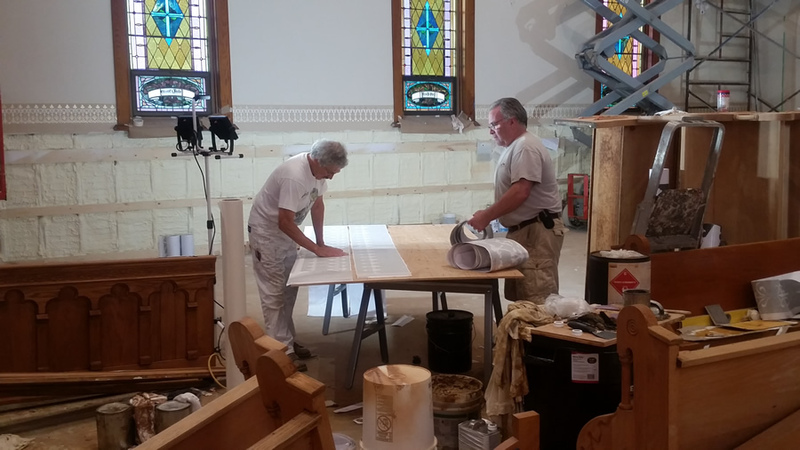 Charlie and Steve have been cutting and getting the stencils ready for Tim, Brian and Rick up on the lift. 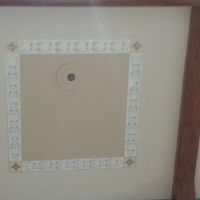 Most of the stencils have 2 or 3 colors plus the gold flake. 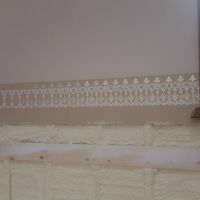 The stenciling has proven to be a challenge. 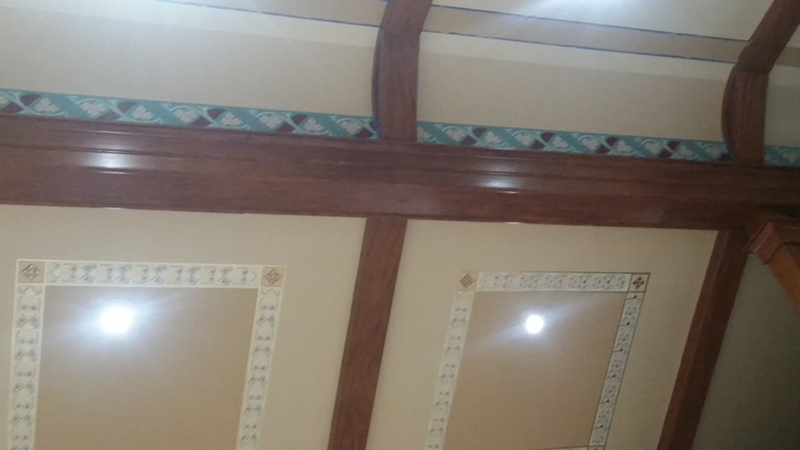 Very tedious and very time consuming. 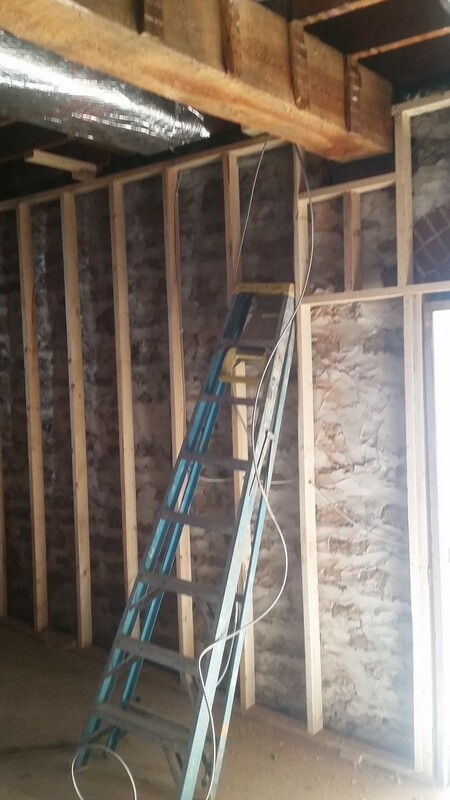 But I just can't wait for the end result. 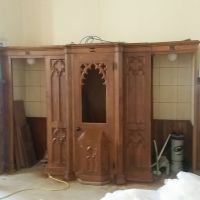 Eileen has been busy organizing all of them. 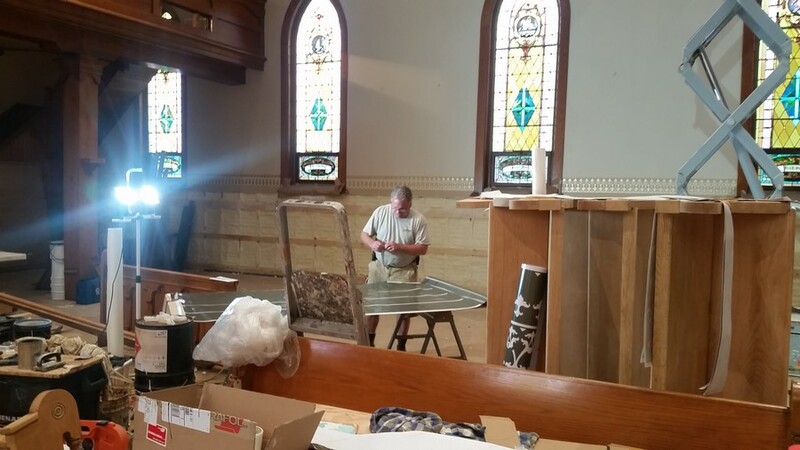 Steve has even been cutting and pulling stencils. 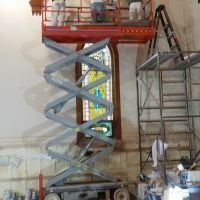 Keep praying that everything goes smoothly for the painters and Eileen. 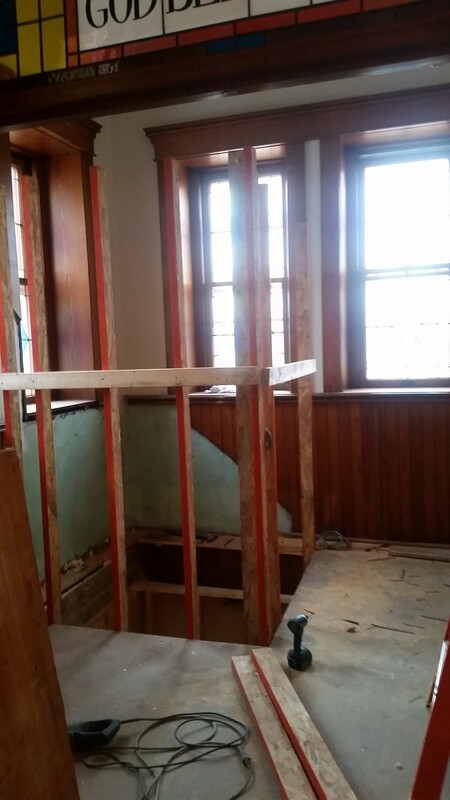 We are still collecting donations for the upgrades. 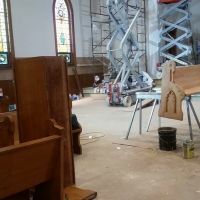 There is a list on the table by the bulletins. 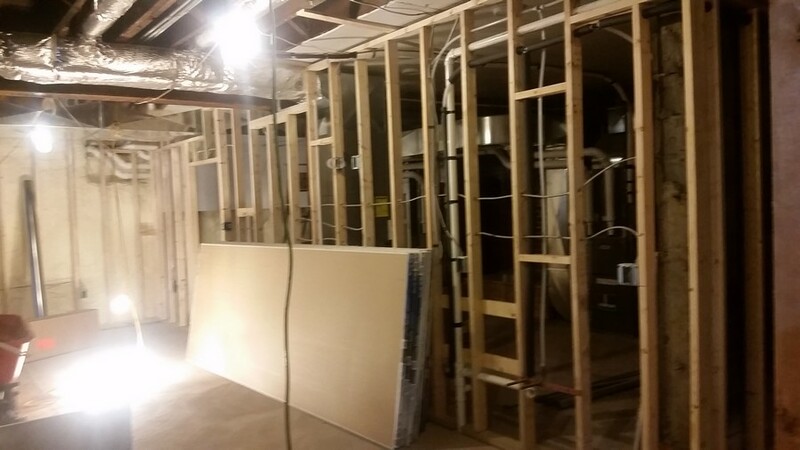 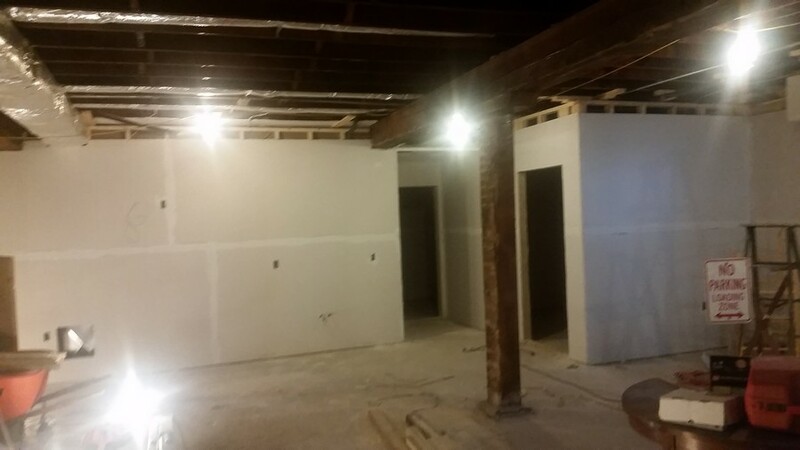 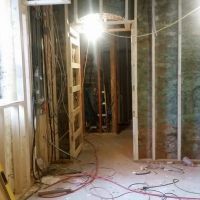 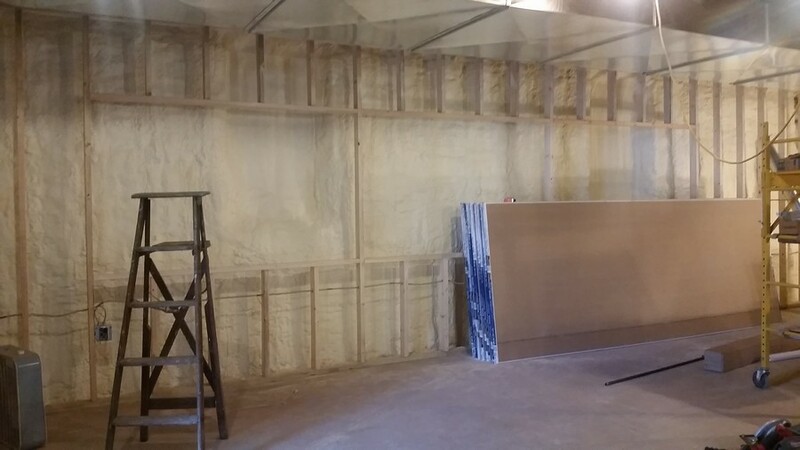 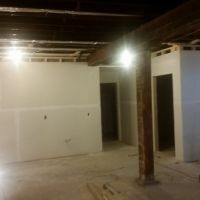 Sheetrock in the basement should start this week. 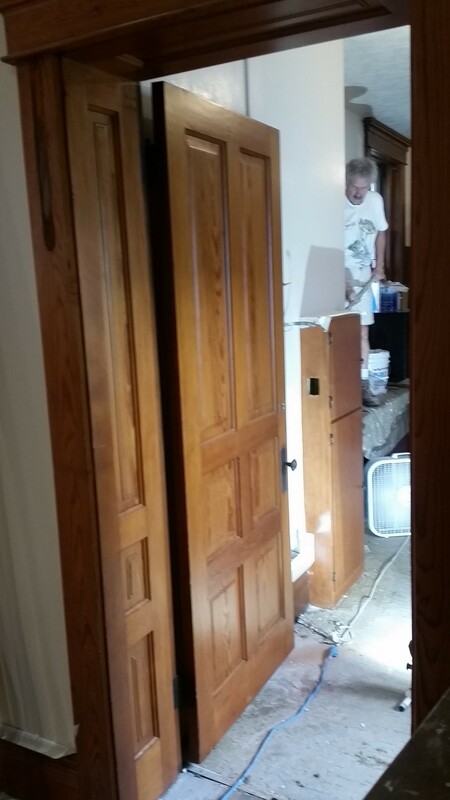 Flooring people should be here in 2 weeks. 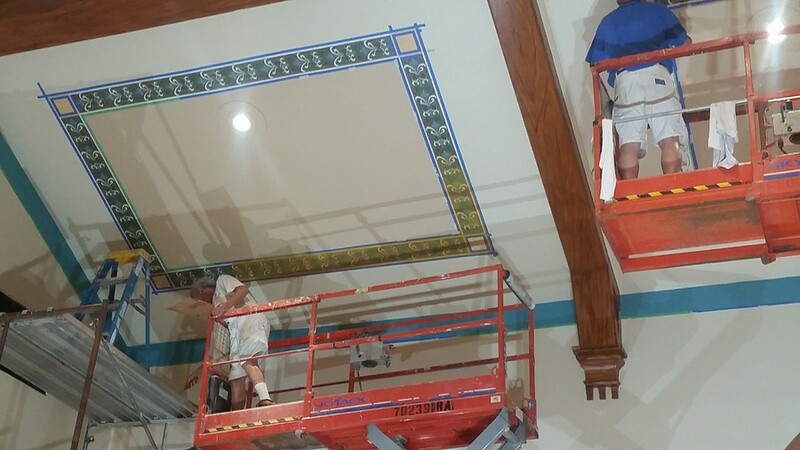 The stencils are going on slow. 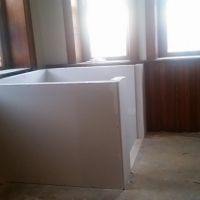 It is a 4 step process and everything has to be dry before moving on to the next step. 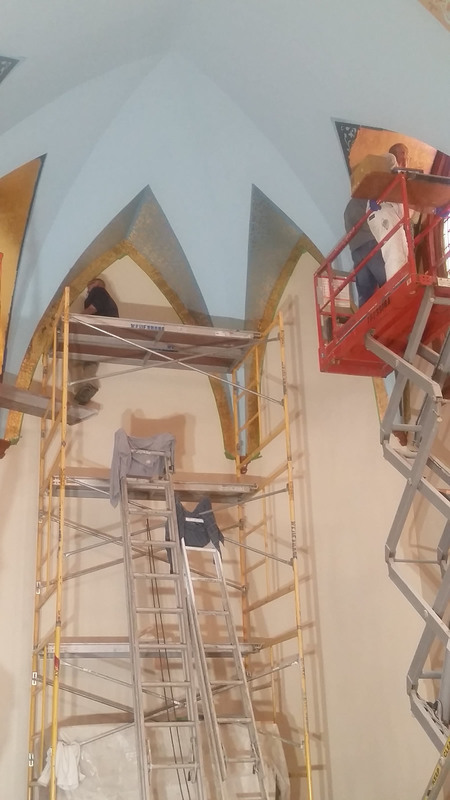 The guys are putting up the color and Charlie is finishing the first one with gold flake paint. 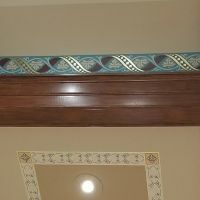 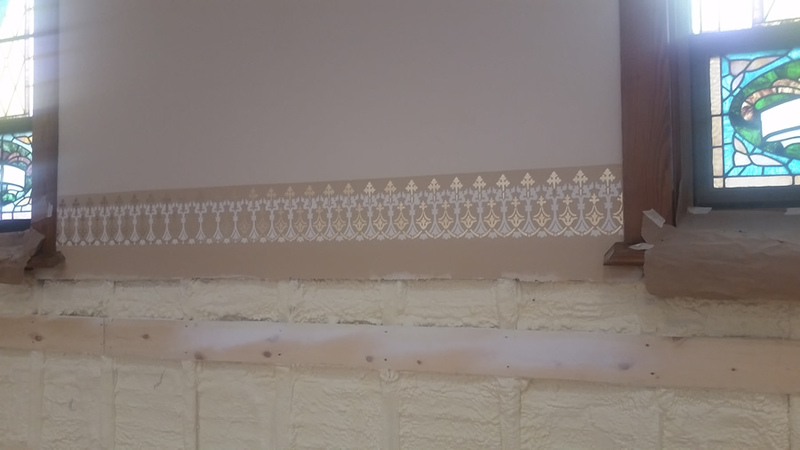 The stenciling above the wainscot is all finished. 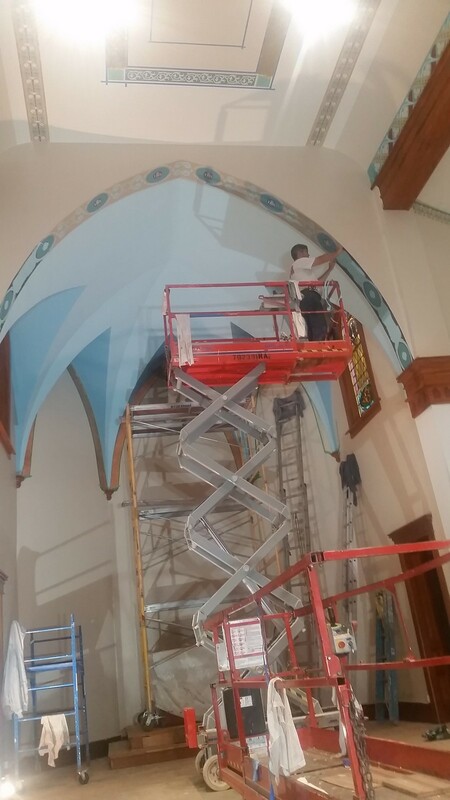 Keep all the painters and Eileen in your prayers. 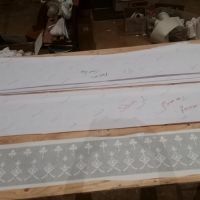 Stencils are so stressful. 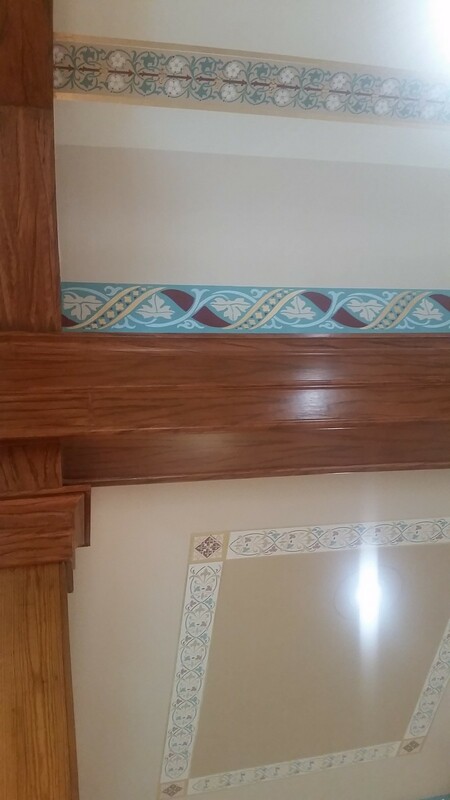 They are very touchy and they have to match exact. 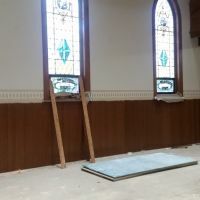 Eileen will have some display/presentation boards upstairs in the Parish Life Center for anyone to look at after Mass on Sunday. 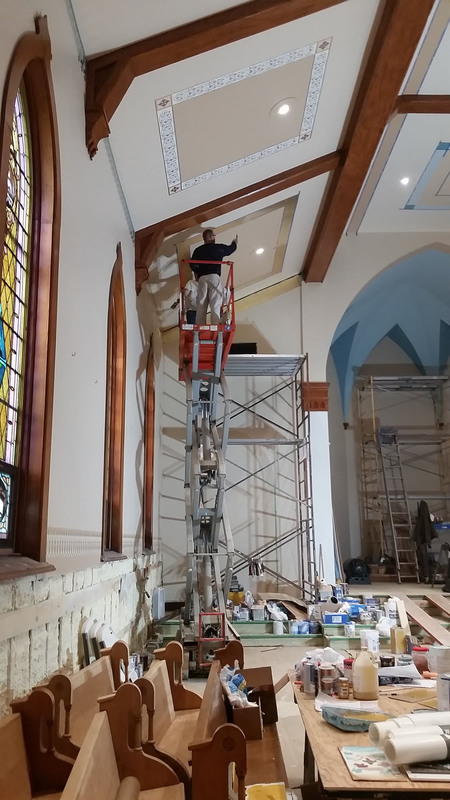 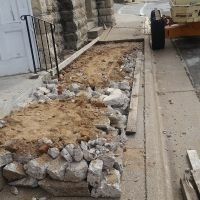 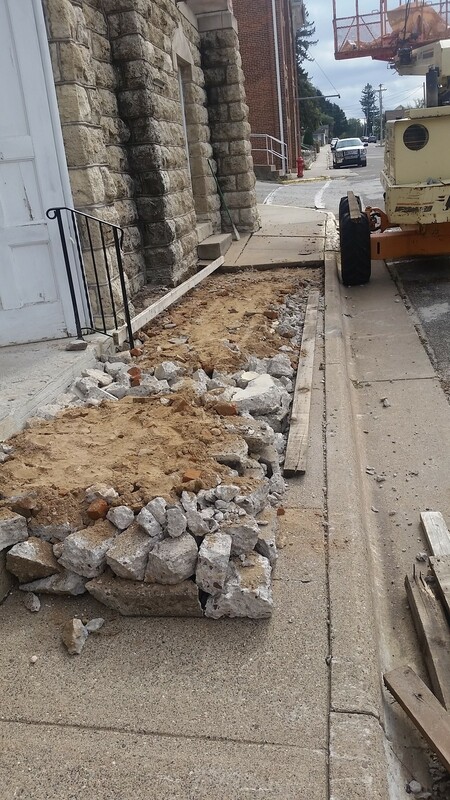 We are still short on donations for our upgrades to our church. 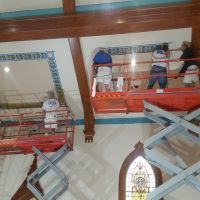 Rick & Charlie have been working with Eileen to get all the stenciling right. 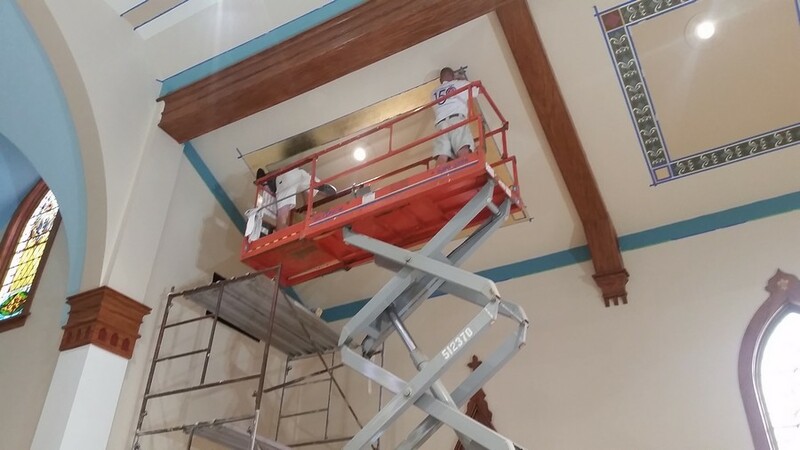 It is such a tedious job. 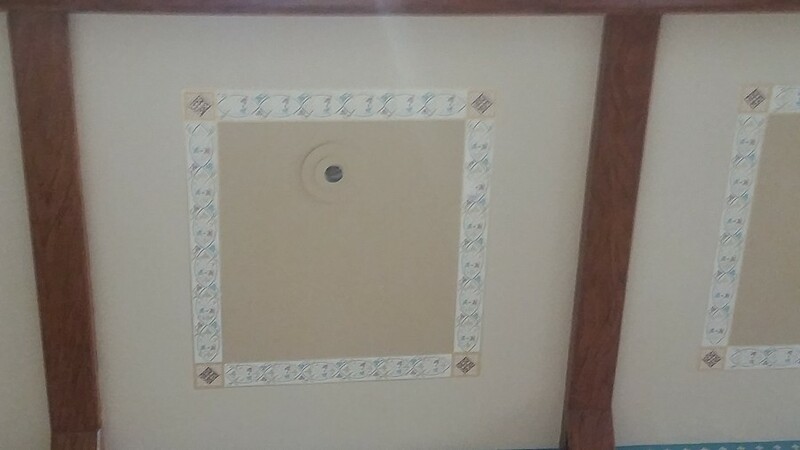 Everything has to match up just right. 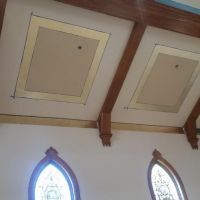 There will be 3 colors of paint in the stencils on the ceiling. 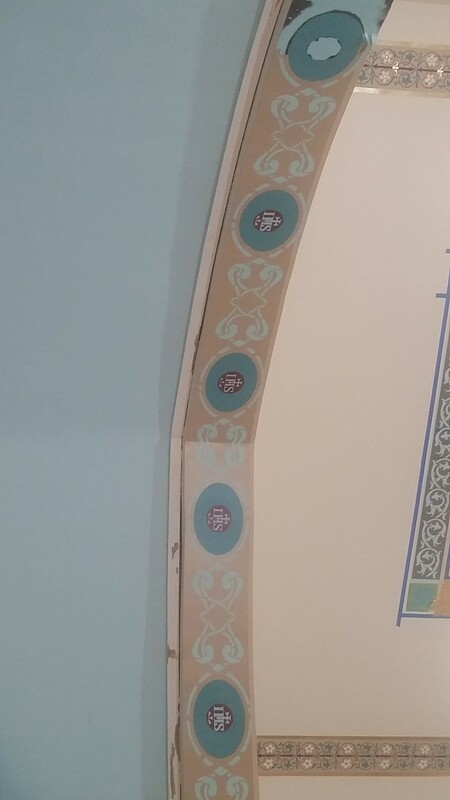 Which means there will be 3 sets of stencils to put up and match the design. 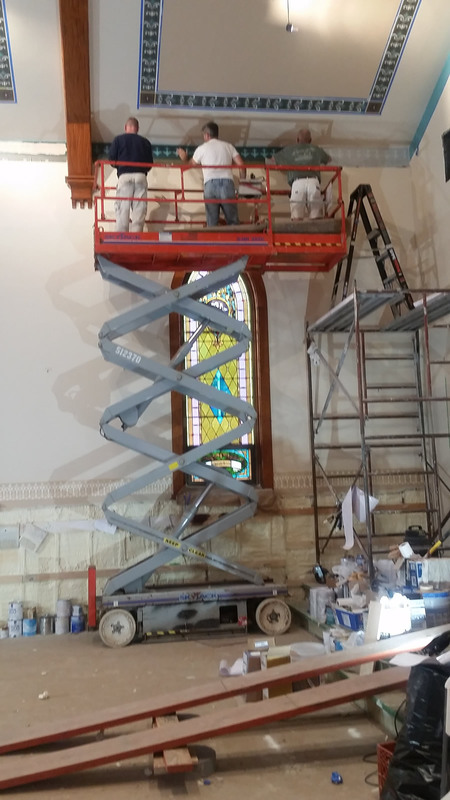 They are very patient men. 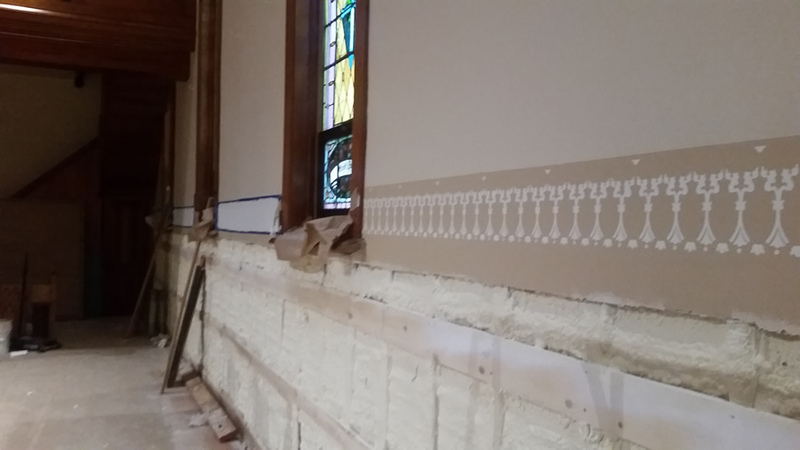 Eileen is back with some stencils. 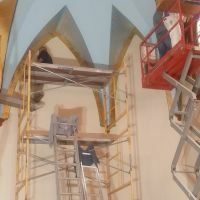 Charlie and Rick have started painting the first layer around the side. 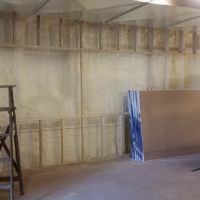 There will be a couple of layers yet to add. 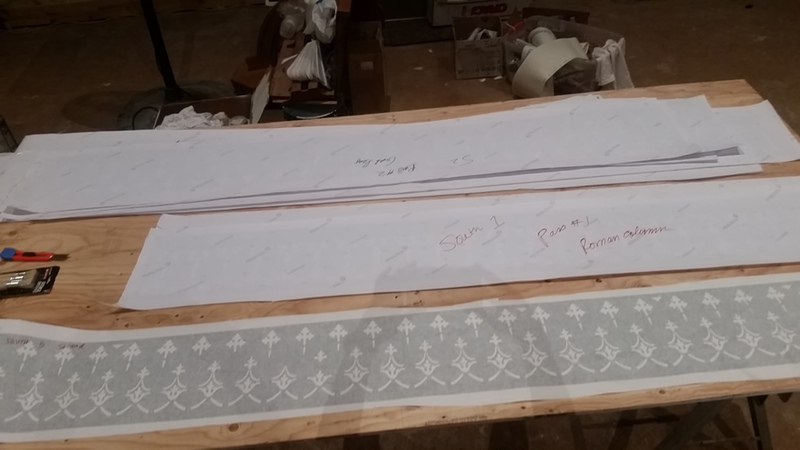 There are piles of stencils that she has brought. 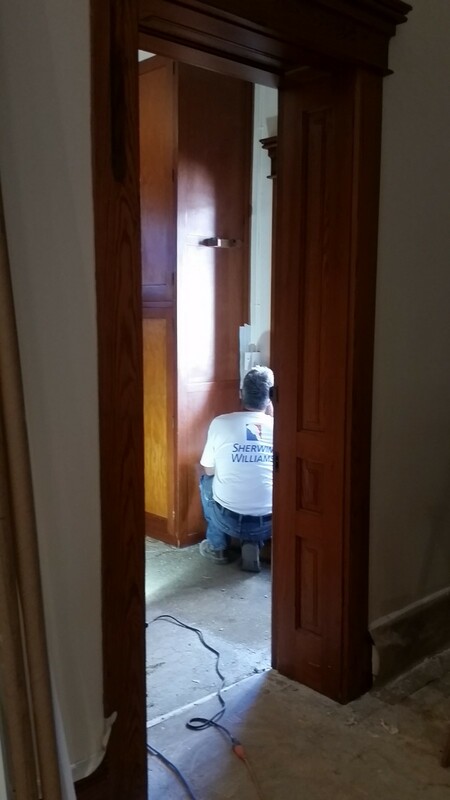 The guys will be busy now. 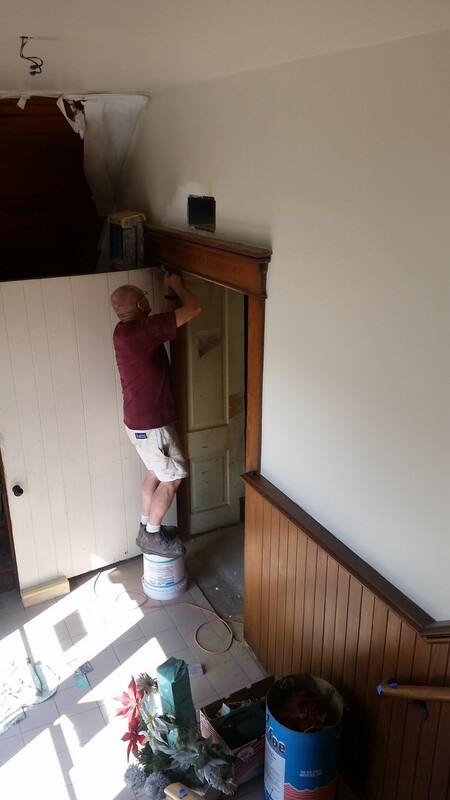 Rick is scraping the wood downstairs by Hansen Hall so it can be stained and varnished. 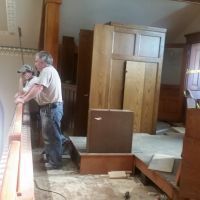 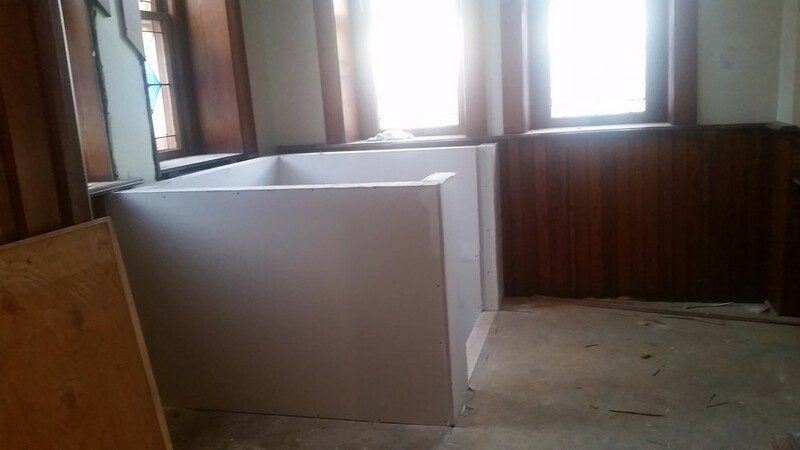 Charlie and Brian have one sacristy done and working on the other side sacristy. 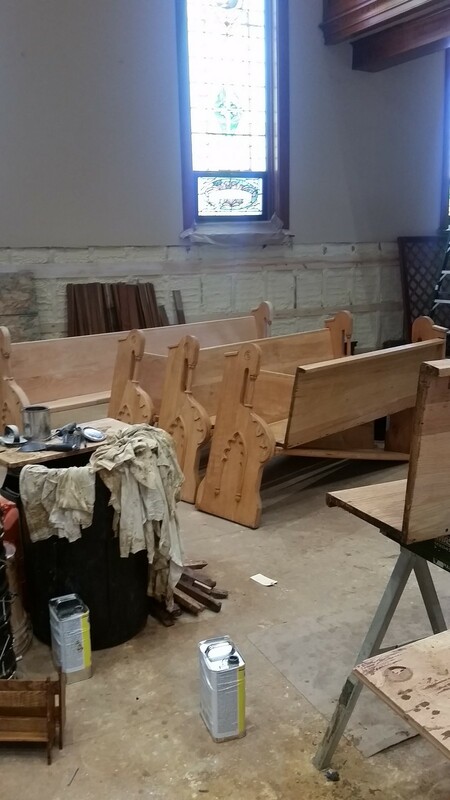 Stripping of the next batch of pews has begun. 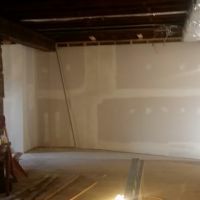 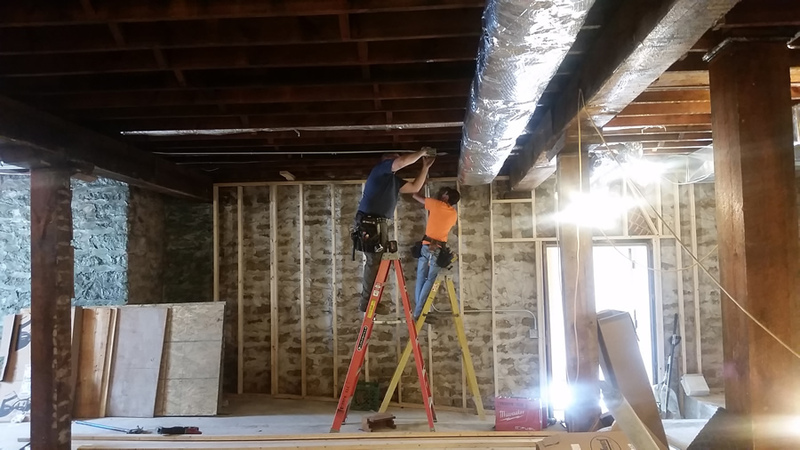 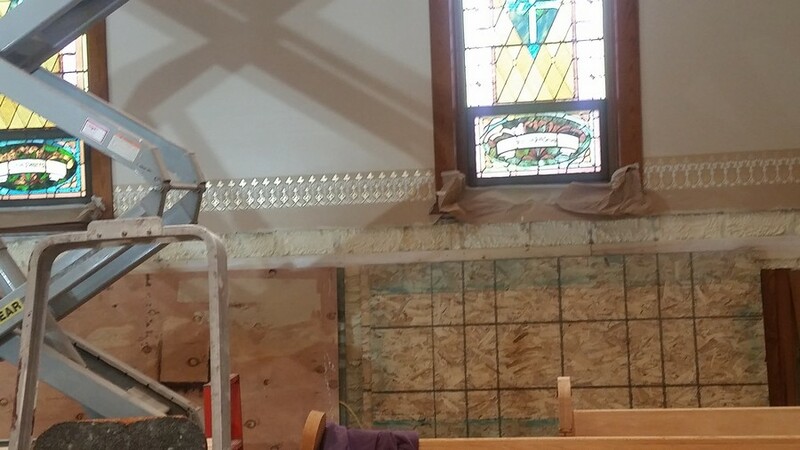 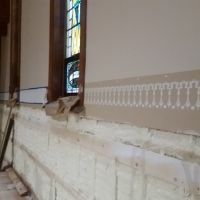 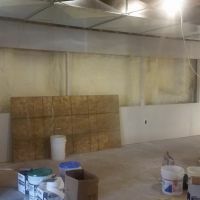 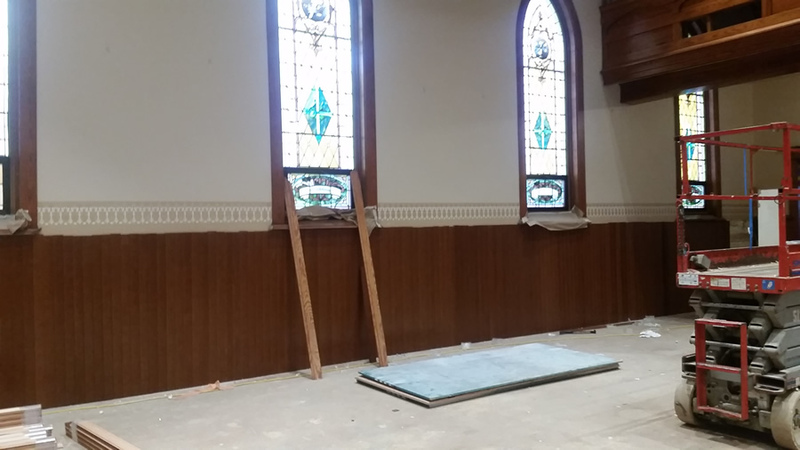 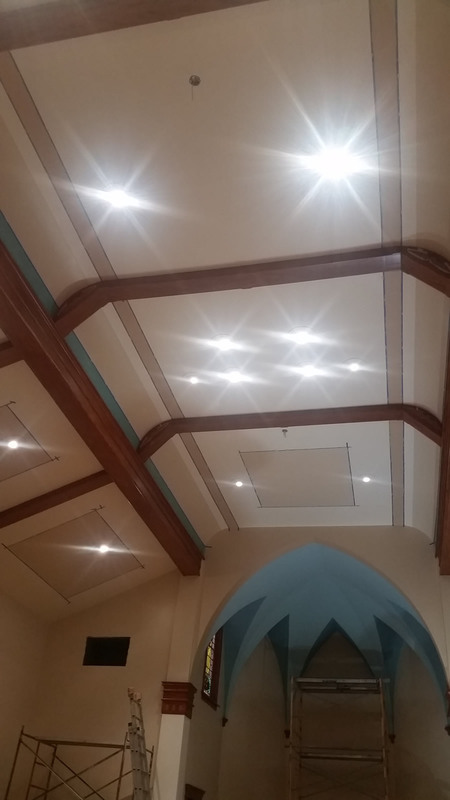 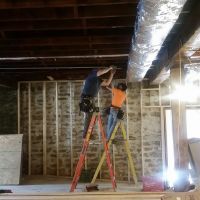 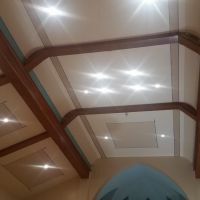 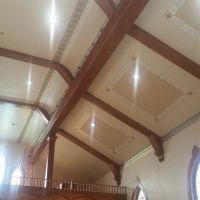 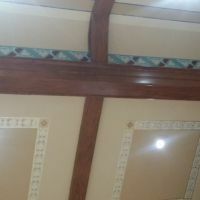 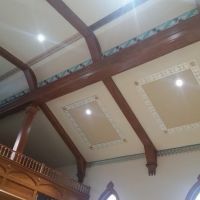 We still need donations to cover all the upgrades that we would like to get done in the church. 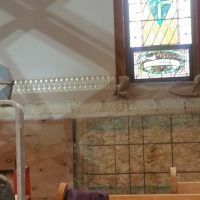 There is a list of upgrades and estimates next to the bulletin. 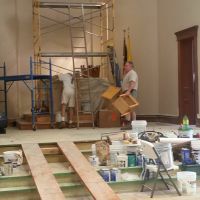 Cleaning out all the stuff in the sacristy so the painters can get in there to patch and paint. 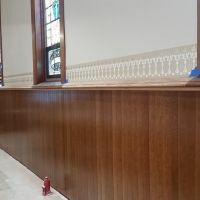 Steve has the confessionals stained and varnished. 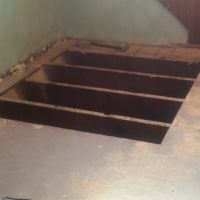 The insides will be updated also. 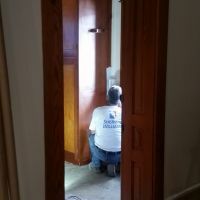 The plumbers are working downstairs when they can. 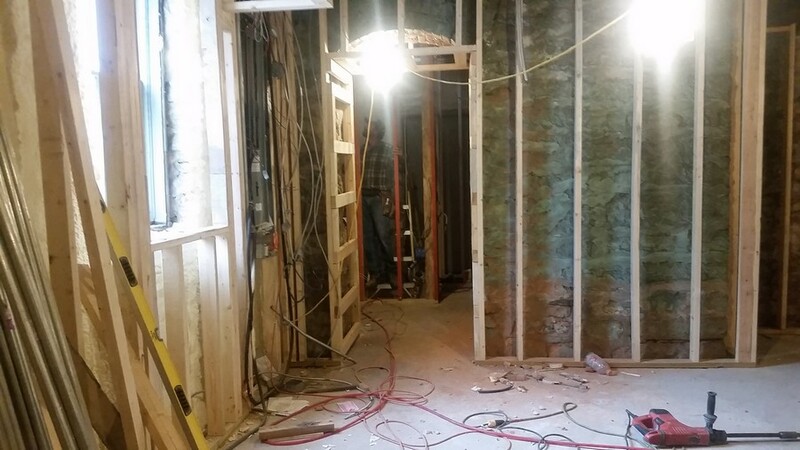 Almost have everything plumbed downstairs in the hall, bathrooms and furnace room. 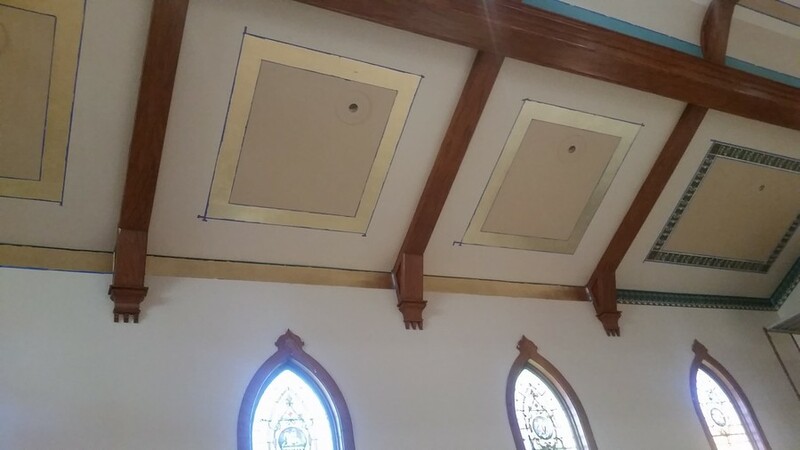 The painters have added a few more accent colors. 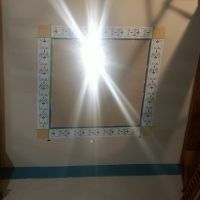 I can't wait until the stenciling starts. 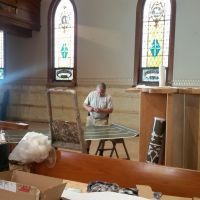 Steve is refinishing the old altar. 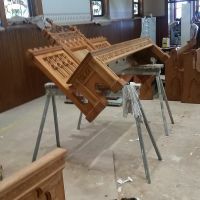 They are gong to match the wood and stain with the new additions that are being made to the altar. 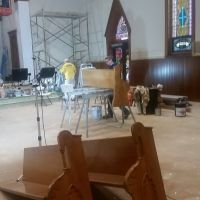 There will be a handout at church this weekend with estimates of how much the upgrades will cost. 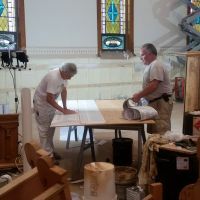 Attached to that is a hand drawn picture from Eileen of what the new altar will look like. 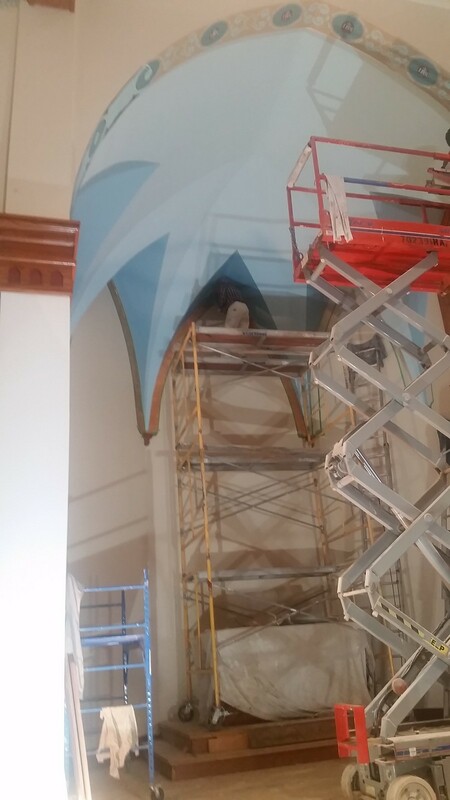 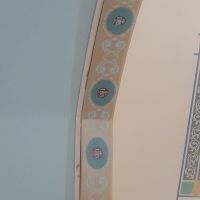 A few more colors have been added to one side of the church. 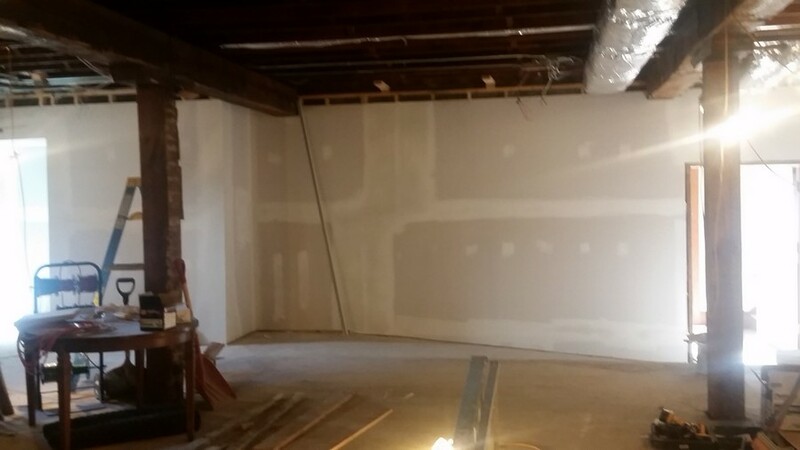 The white is where the stencils will go. 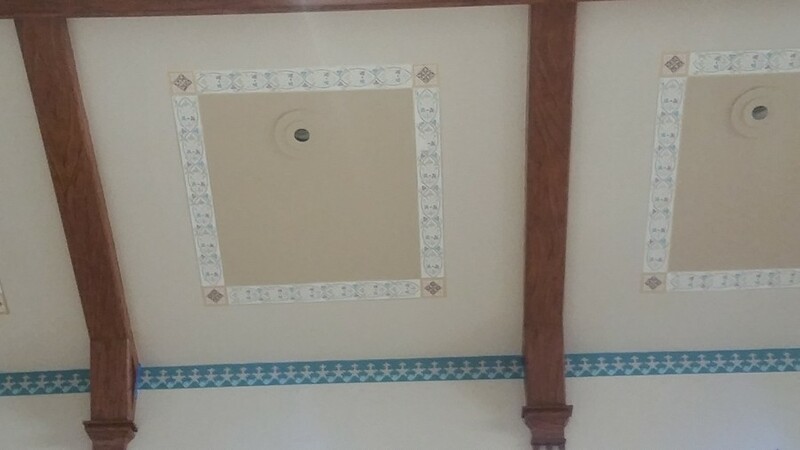 The blue and the dark tan color are accents. 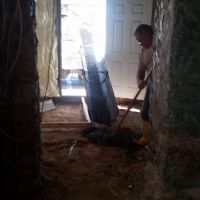 I am looking forward to Eileen coming back next week and what surprises she will have for us. 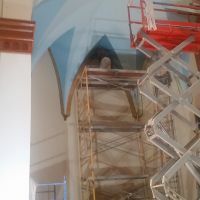 I will not be posting any pictures on Tuesday or Thursdays since I will be out at St. Boniface School in Waumandee. 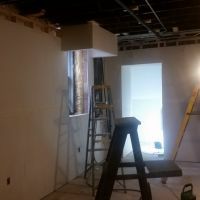 But don't forget to check it out the other 3 days!